The last three weeks of the exhibition was a great success. The last event was the N.U.N.A seminar by Lee Chi-hun of S.O.A. I would like to express my gratitude to the many visitors who have visited. 에스오에이 이치훈 소장의 누나 세미나 행사를 마지막으로 지난 3 주간의 전시를 성황리에 잘 마쳤습니다. 그 동안 찾아주신 많은 방문객들께 감사의 말씀을 드립니다. 앞으로 더 활발히 활동 이어나가도록 하겠습니다. The architect group N.U.N.A. started in 2008 with the introduction of Lim Jin-young, journalist of SPACE magazine. Since then, Kim Ho-min, Mee-Woong and Oh Young-wook have been working as a group of architects while Yang Soo-in and Lee Chi-hoon joined later. N.U.N.A is an abbreviation of New Urbanism New Architecture, but it is actually borrowed from the name of the bar that we often visited at the time. Since then, we have been running a seminar to critique each other’s work based on friendship that has persisted over the past decade and have been releasing the results on the web. This exhibition was decided immediately by giving an idea to utilize the vacant lease space, and it was prepared just in a week and opened immediately. It was an event that would not have been possible without friendship. We have been doing seminars for a long time, so we know each other’s projects well, but we were also surprised to see the result by putting their works together. Although there was not enough time to plan for the exhibition but it was surprising to find more than 100 visitors on the weekend. Also, many of them gave us good opinions. The exhibition will end on April 1st after a seminar that will be held on this Sunday. We are going to continue the activities of N.U.N.A with this opportunity. I would like to express my gratitude to the many people who visited the exhibition. 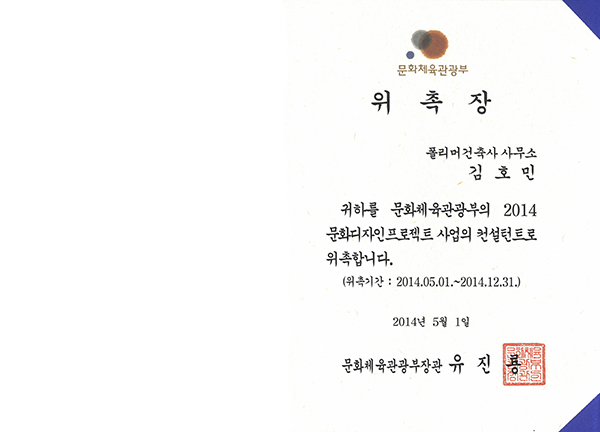 건축가 그룹 누나는 2008 년 당시 공간의 임진영 기자님의 소개로 건축가 김호민과 고기웅, 오영욱이 만나면서 시작되었습니다. 그 후로 미국에 체류 중이던 양수인과 이치훈이 합류하면서 건축가 그룹으로 활동을 시작했습니다. 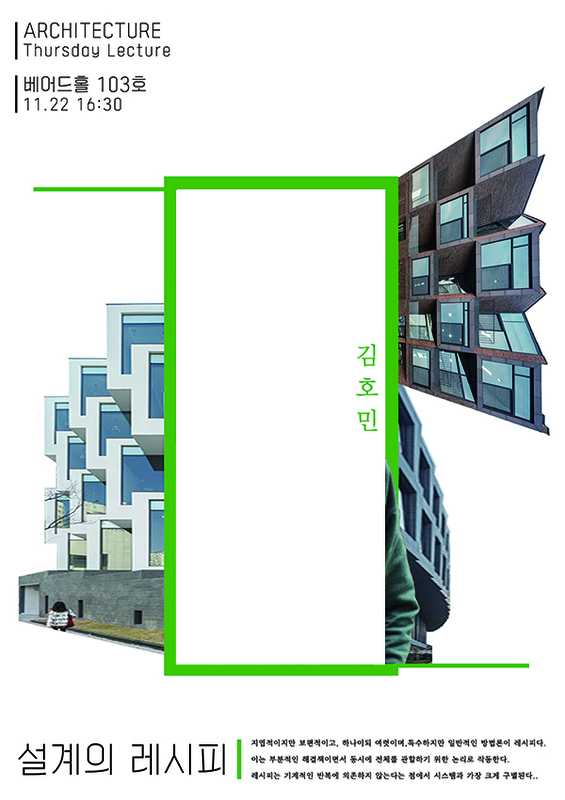 누나는 New Urbanism New Architecture의 줄임말인데 실은 당시에 자주 다니던 주점 이름에서 빌려왔습니다. 이때부터 지난 10 년 동안 끈끈하게 이어진 동료애를 바탕으로 서로 작업을 크리틱하는 세미나를 지속적으로 운영하고 있고 그 결과물을 웹에 오픈해왔습니다. 이번 전시회도 비어있는 임대 공간을 활용하자는 아이디어를 내면서 즉각적으로 결정되었고 일주일 만에 급하게 준비해서 오픈하게 된 것입니다. 아마도 서로 매우 친한 동료들이 아니었다면 불가능했을 행사였습니다. 그 동안 세미나를 오랫동안 해왔기 때문에 각자 사무실의 프로젝트들에 대해서 잘 알고 있기도 했지만 작업들을 한 곳에 모아놓은 모습에 서로 놀라기도 했습니다. 급하게 준비하면서 전시에 대한 기획이 부족한 점이 아쉽긴 했지만 주말에는 100 분 이상이 찾을 정도로 관심이 높았습니다. 또한, 많은 분들이 좋은 의견들을 남겨주시기도 했습니다. 이제 이번 일요일에 있을 누나 세미나를 끝으로 4월 1일에 전시회를 마감할 예정이고요, 이번을 계기로 그룹 누나의 활동을 더 활발히 이어나갈 생각입니다. 전시를 찾아주신 많은 분들께 감사의 말씀을 드립니다. N.U.N.A exhibition Opening at Hannam-Yong Bldg. 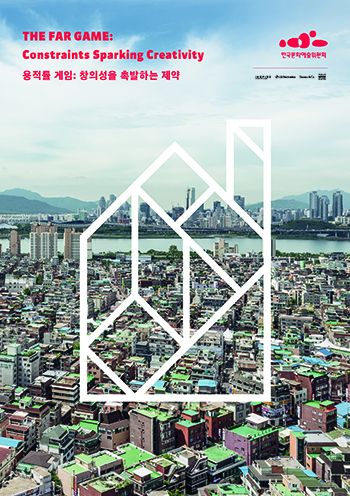 The N.U.N.A (New Urbanism New Architecture) exhibition will take place in Hannam Yong building at Hannam-dong 68-16 from the 14th of March to the 1st of April. The group talk will be on the 31th of March at 4 pm at Hannam Yong building just before the closure. 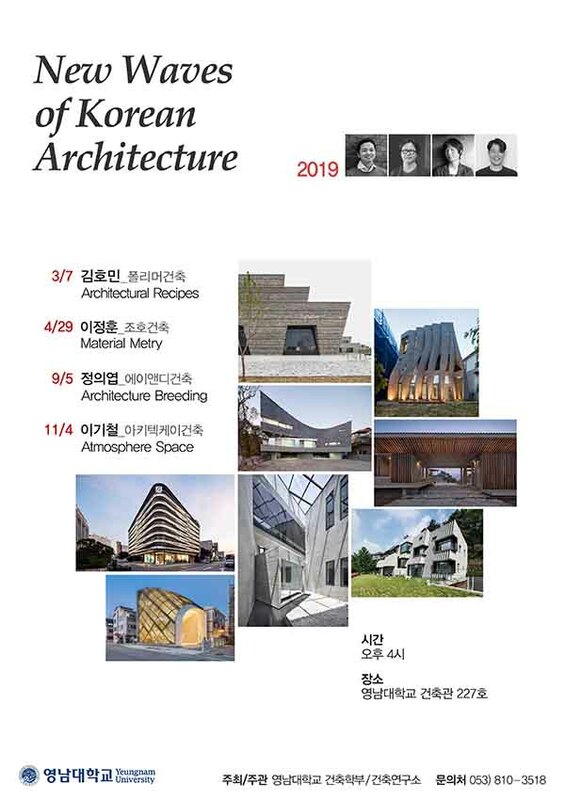 As part of the Lecture Series-New Waves of Korean Architecture-, Homin Kim from poly.m.ur will speak on the 4th of March at Youngnam University. The talk will be about the way we can learn qualities from architecture without architects, incorporate them into the existing system and develop a new methodology, which we call ‘Architectural Recipes’. 3월 8일 저녁 7시에 건축그룹 ‘누나’ 의 전시회 오프닝을 한남동 68-16번지 용빌딩에서 합니다. 건축가 고기웅, 김광수, 김호민, 신경섭, 양수인, 오영욱, 이치훈 건축가가 참여할 예정입니다. 오랜만에 폴리머건축사무소에서 참여했던 윤증초등학교 단설 유치원 현상 설계안이 건폐율 오기로 실격 처리되어 제대로 된 심사조차 받지 못했습니다. 겨우 0.7% 건폐율을 초과하기 위해 의도적인 법률 위반을 하는 위험을 감수하면서까지 설계할 리가 만무할텐데도 기술심사를 담당하는 분들의 경직성과 공익성을 위하는 그 엄격함에 놀랄 뿐입니다. 15팀의 지원자들 중에서 하나를 골라야 하는 고충은 이해됩니다만 건폐율 오기로 인해 감점도 아니고 실격을 시키는 건 현상 설계가 어짜피 답이 하나 있는 시험도 아닌데 너무 과한다는 의견입니다. 참고로 건폐율은 벽 두께에 중심선을 어디에 두느냐에 따라 1% 정도의 오차는 충분이 날 수 있습니다. 언제나 ‘갑’ 인 그들에게 항상 ‘을’ 일 수밖에 없는 설계자들도 이 나라의 국민입니다. 입장을 바꿔놓고 봤을 때 텍스트 오기로 심사도 못 받게 하는 처사가 과연 그 공정이란 잣대에 적합한지 되묻고 싶습니다. 현상설계 제출물의 양이 예전에 비해 상당히 줄어들었음에도 불구하고 한달 반 이상 네 명이 밤마다 야근을 해야 겨우 좋은 안을 나오는 현실을 고려했을 때 너무 가혹한 처사는 아니었는지 기술심사를 담당했던 서울시 남부교육청 담당자들께 되묻고 싶습니다. 2018 Best 30 건축전에 전시되고 있는 건축을 중심으로 특집으로 마련된 건축문화 452호에 폴리머의 딥하우스가 4페이지에 걸쳐 소개되었습니다. 2011년에 시작하여 2016년 10월에 완공했던 단독주택으로 여러 매체에 이미 소개되기도 했습니다. 건축설계학회에서 주최하고 서울 Adik 건축갤러리에서 전시될 2018 Best 30 건축전에 폴리머건축사무소가 초대되었습니다. 2월까지 같은 장소에서 전시를 하고, 3월부터는 세종시, 경북도청, 부산, 진주, 광주에서 각 1 개월씩 순회 전시할 예정이라고 합니다. Lee Jung Seob Art Gallery has undergone remarkable growth and changes over the last 10 years. A museum which had nothing but the building itself has turned into a landmark of Jeju, where over 300,000 visitors come and visit to see the works of Lee Jung-seob. Meanwhile, the streets of Lee Jung-seob have increased in its popularity along with the museum, making its size and facilities unsuitable for increasing visitors. The unfortunate reality is that not only is there not enough space to display art, but also a lack of facilities where visitors could rest. Until now, we have been fortunate to have the excellent landscaping and access that offset the shortcomings of the museum. However, it has reached the time when we have to consider adopting basic facilities that are essential for a museum such as storage facilities, cafes, rest areas, and even bookstores. After all, it is important to make visitors feel Lee Jung-seob gallery as the part of a memorable time of their trip in Jeju together with the smell of the sea rather than just a few pieces of art. Sharing the ocean and nature the artist once experienced, and his point of view of them, is perhaps more valuable experience than the museum itself, even though they are not visible. 10 years ago, when the gallery was just built and did not even have a single piece of art, Lee Jung-seob gallery was simply an empty building. The building was still meaningful just with its presence, but it wasn’t a place for an exhibition. It is necessary to supplement the gallery in order to make it as both a dignified place where people could enjoy art and a landmark of Jeju Island. Rather than building a new museum, we would like to propose preserving the existing museum and supplementing the necessary facilities in underground space. To pursue the museum as a total concept of experiencing culture, leisure, and relaxation at the same time, we have to start considering the facilities of the museum. 이중섭 미술관은 지난 10 년 동안 괄목할 만한 성장과 변화를 겪어왔습니다. 작품 한 점 없이 그저 건물만 덩그러니 지어졌던 미술관이 이젠 이중섭 화백의 작품들이 실제로 전시되고 있고 있고 연간 30 만명 이상의 방문객들이 찾는, 서귀포와 제주의 명소가 되었습니다. 한편 미술관 주변의 이중섭 거리까지 더불어 유명해짐으로써 규모와 시설에 비해 너무 많은 관람객들이 찾게 되었습니다. 미술을 전시하는 공간이 부족할 뿐만 아니라, 부대시설도 거의 없기 때문에 앉아서 관람을 마치고 쉴 곳 하나 마땅치 못한 것이 현실입니다. 다행히 주변에 이중섭 화백이 한때 기거했던 집과 미술관 앞 훌륭한 조경, 진입로가 있어 방문객들에게 이 부족함을 어느 정도 상쇄시키고 있긴 합니다만 전시 공간 외에도, 미술관에 반드시 필요한 수장고와 카페, 휴게 공간, 심지어 서점 등 최근 미술관에 기본적으로 들어가는 시설들에 대한 고민을 시작해야 할 때가 되었습니다. 결국 이중섭을 개별적인 미술 작품들로 기억하기 보다는 제주 여행의 일부로, 지인들과 함께 찾았던 거리의 일부로, 또한 옥상에 올랐을 때 보이던 바다의 냄새까지 종합적으로 느낄 수 있게 하는 것이 중요합니다. 작가가 한때 경험했던 바다와 자연, 그리고 그것을 바라봤던 시점을 공유한다는 것은 비록 눈에 보이지는 않지만 실제로 존재하는, 어쩌면 미술관 그 자체보다도 더 소중한 경험일 것입니다. 십 년 전에 지어진 이중섭 미술관은 당시에 작품이 한 점도 없던 시절에 지어진 그야말로 허울뿐인 곳이었습니다. 당시엔 공간이 있는 것 자체만으로 의미가 있었지만 작품을 전시하기 위한 장소는 아니었습니다. 앞으로도 제주의 명소인 동시에 제대로 미술을 감상할 수 있는 품위 있는 장소가 되기 위해서는 공간에 대한 보완이 필요한 상황입니다. 신축보다는 기존 미술관을 잘 활용하고 보존하되 단지 지하 공간에 부족한 시설을 보완하는 것을 제안하고자 합니다. 이중섭 미술관을 통해 문화와 여가, 휴식을 동시에 경험하는 토탈 개념으로서의 미술관을 지향하기 위해 이제는 시설에 대한 고민을 시작해야 할 때라고 생각합니다. 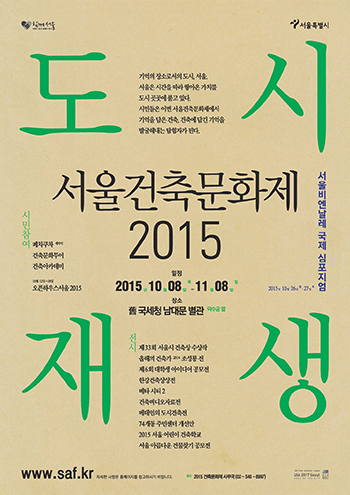 A design conference is going to be held under the name of Lee Jung-seob gallery. 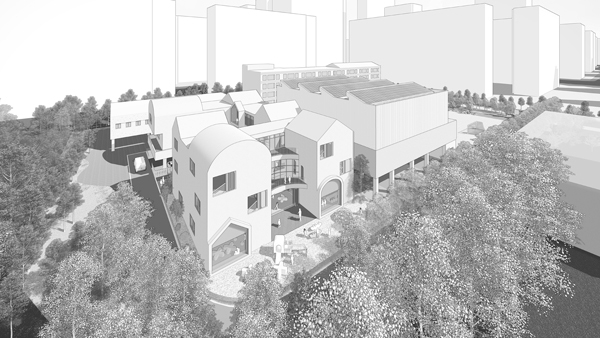 Its intention is to build a center of culture and arts in the area of Double-sup street by strengthening the cultural brand of Lee Jung-seob who has left a distinct mark in the history of modern and contemporary art in Korea. Currently, there is a demand for a solution to improve and expand the viewing environment, due to a sudden increase in the number of visitors. In accordance to this problem raised, architect Yang Geon, architect Kim Ho-min, and the head of the art workshop of Sagrada Familia Cathedral Sotoo Etsuro will be having a discussion about the development of the museum and its surrounding areas. Sotoo Etsuro has been in charge of the sculpture of Sagrada Familia Cathedral, inheriting a spirit of Gaudi for last 40 years, and has completed the door to the Façade of the Nativity which was registered as a UNESCO World Heritage Site in 2015. The first talk will be about “the power of Gaudi”. Subsequently, director Kim Ho-min will introduce about the European museums under the theme of utilizing the space in public museums and make brief suggestions on how to enhance the museums’ facilities. And lastly, Yang Geon representative of GAU architectural firm is going to present about how to change the paradigm of urban renewal strategies to revitalize the museum’s operations, and what would be gained from it, in respect to urban regeneration. We hope this will be an opportunity to participate and discuss the issue together for those who are in Jeju and are involved in architecture. 이중섭 미술관 주체로 열리는 디자인 컨퍼런스가 개최될 예정입니다. 우리나라 근현대미술사에 뚜렷한 족적을 남긴 이중섭 화백의 문화브랜드를 강화함으로써 이중섭 거리 일대를 문화예술의 핵심 거점으로 구축한다는 취지 하에 열리는 자리입니다. 특히 최근 관람객 급증으로 인해 미술관의 관람환경 개선 및 확충이 시급함에 따라 보완할 방법을 찾고자 합니다. 이에 따라 미술관 및 주변 일대의 발전 방향을 모색하기 위해 양건, 김호민의 건축가와 사그리다 파밀리아 대성당의 예술공방 주임이신 소토 에츠로씨가 모여 토론할 예정입니다. 소토 에츠로씨는 지난 40 년간 가우디의 정신을 이어받아 사그리다 파밀리아 대성당의 조각을 담당하고 계신 분으로 2015년 유네스코 세계유산으로 등록된 탄생의 파사드의 문을 완성시키기도 했습니다. 첫번째 발표자로 가우디의 힘을 주제로 강연을 진행할 계획입니다. 이어 김호민 소장님은 공공 미술관의 공간 활용에 대한 방향성 모색이란 주제로 유럽의 미술관들을 소개하고 미술관의 시설 보강 방안에 대해서 간단히 제안하신다고 합니다. 마지막으로 가우 건축 양건 대표님께서는 도시재생 관점에서 미술관 운영 활성화 방안 모색을 위한 도시재생전략의 패러다임을 전환하고 이로써 무엇을 얻을 것인가를 주제로 발표하신다고 하니, 제주에 계신 건축에 관계된 분들께서 참여해서 함께 토론할 수 있는 기회가 될 수 있으면 좋겠습니다. 김호민 소장님의 강의가 숭실대학교 건축학부에서 주최하는 목요 강좌의 내용입니다. 우리는 건축 설계에서 과정이 매우 중요하다고 말하곤 합니다. 그런데 도대체 그 설계 과정이란 무엇일까요? 건축 설계하는 사람들에게는 매번 새로운 설계를 할 때마다 반복해서 밟아가는 일종의 순서가 있습니다. 잠재적으로 존재하고 있는 설계 순서가 있습니다. 사이트 분석을 통해서 매스 스터디로 시작하든, 평면을 먼저 짜고 입체로 올리든, 작은 상자들을 쌓아서 건물로 만들든, 개인마다 조금씩 다르긴 해도 순서가 있기 마련입니다. 그런데 그것을 구체적으로 설명하는 경우는 극히 드뭅니다. 사실 그것을 굳이 드러낼 필요가 있을까 란 물음에도 일리가 있습니다. 하지만 요리가 진화해왔듯이 건축도 마찬가지라면 그것을 만드는 레시피 즉 건축 설계의 방법론이 달랐기 때문이 아닐까요? 즉, 건축은 결과물이고 방법론이 과정이라면 그 시대의 사람들이 시행착오를 통해 쌓아온 지식의 일부로서 볼 수 있지 않을까요? 건축은 매번 위치, 건축주, 프로그램 등 조건들이 다르기 때문에 이에 따라 설계의 과정도 함께 달라질 수 밖에 없습니다. 설계의 방법론이 조건에 따라 어떻게 변화하는 지 그려볼 수 있다면 이것이 바로 특정한 건축가의 설계 방법론이자 레시피라 할 수 있겠습니다. 프로젝트마다 달라지는 것을 가정하면서 설계의 순서도, 알고리즘으로 정리해보는 것이 그 출발점이 될 것입니다. 요리사에게 레시피는 요리의 파트너입니다. 절대적인 순서라기보다 어느 정도 밟아나가야 할 룰입니다. 반복하면서 조금씩 변화를 주지만 창의성을 발휘할 필요가 있을 때 아주 큰 변화를 주기도 합니다. 매일 같은 요리를 반복하는 것 같아도 지속적으로 변화를 주기 마련입니다. 단지 그 정도의 차이만 다를 뿐입니다. 건축가는 이에서 한발 더 나아갑니다. 대지와 요구하는 기능, 건축 법 등 조건이 매번 다르므로 디자인을 결정해가는 과정의 순서를 통해 개인의 창의성이 개입되기 시작합니다. 설계 과정은 기본적으로 순서도이자 알고리듬이라고 정의하는 것, 하지만 그것이 매번 조건이 달라지기 때문에 바뀐다는 것, 그리고 건축가의 창의성이 개입하기 위해서 모호하게 머릿속에만 놔두기보다 구체적으로 정리해보고 그 변화 과정을 관찰할 필요가 있다는 점을 강조했습니다. The project ‘MyGumi’ by Lim Hyun-joo, the director of the Poly.m.ur, was introduced in South Korea’s major portal sites, including Daum and Naver. Director Lim Hyun-joo, who joined the company in 2012 and experienced practical and design processes through various projects, has been intense in designing and supervising the construction of her parents’ house, Gumi, her hometown, while giving up her plan to study abroad. 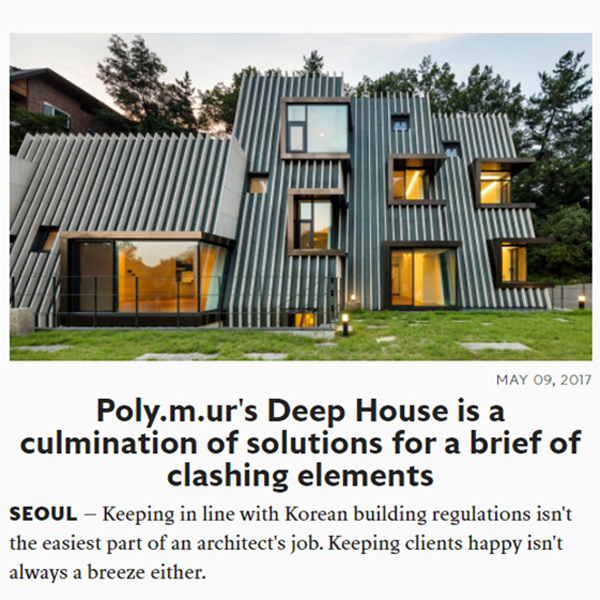 Pursuing a practical yet unique design, Lim Hyun-joo is the future of our firm composed of various staff, as the name ‘Poly.m.ur’ suggests. 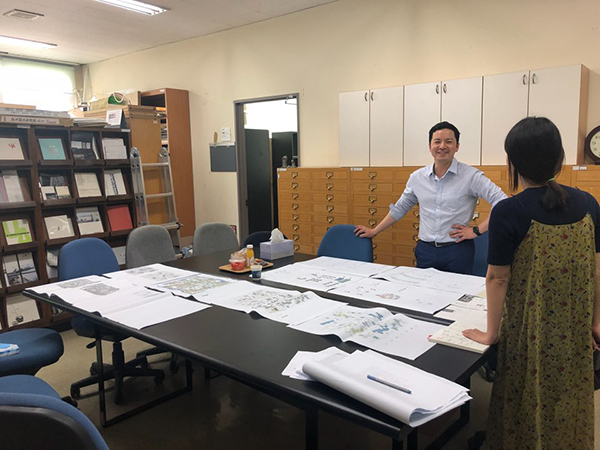 Partners in the office, Kim Ho-min, Sun Ji-hye, Lee Jae-man, and Lim Hyun-joo are working collaboratively to present a new model that aims to cooperate and share, moving away from traditional architectural firms. 폴리머건축사무소 임현주 소장의 ‘나의구미’ 프로젝트가 다음, 네이버 등 주요 포탈 사이트에 소개되었습니다. 2012년 입사하여 만 6 년 동안 다양한 프로젝트들을 통해 실무와 디자인 과정을 익힌 임현주 소장님은 유학 계획도 과감히 포기하면서까지 고향인 구미에 부모님 집의 설계와 감리를 위해 매달리기도 했습니다. 실용적이면서도 독특한 디자인을 추구하는 임현주 소장은 융합체라는 polymur의 의미처럼 다양한 인원들로 구성된 폴리머건축사무소의 미래이기도 합니다. 김호민, 선지혜, 이재만, 임현주는 사무실의 파트너로서 전통적인 건축사무소에서 탈피하여 협력과 공유를 지향하는 새로운 모델을 제시하는 것을 목표로 함께 일하고 있습니다. 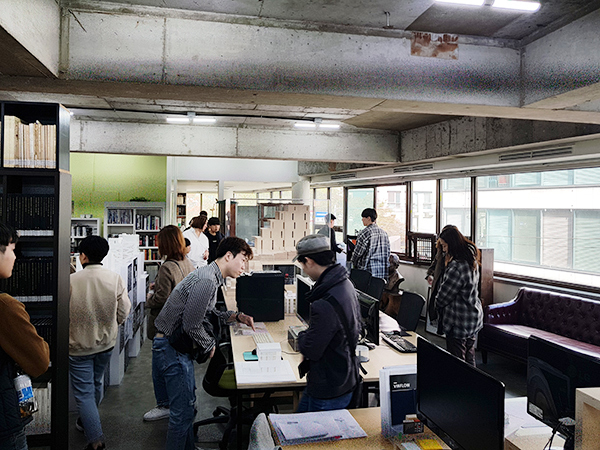 On Wednesday, 14th of November, there is a façade workshop for the third and fifth year students studying architecture at Korea National University of Arts. Director Kim Ho-min and team leader Lee Jae-man will run the workshop together. 11월 14일 수요일 한국종합예술대학 건축학과에서 3학년과 5학년 학생들을 대상으로 파사드 워크샵이 있습니다. 폴리머건축사무소의 김호민 소장님과 이재만 팀장이 공동으로 진행할 예정입니다. There was an open studio event at Poly.m.ur from 1 p.m. on 21st of October. It was the first time to open the office to the public. Among visitors there were as well as the CEO and producer of a broadcasting station who came with two children, a variety of people, including undergraduate students of architecture and architects who have just founded their firms. 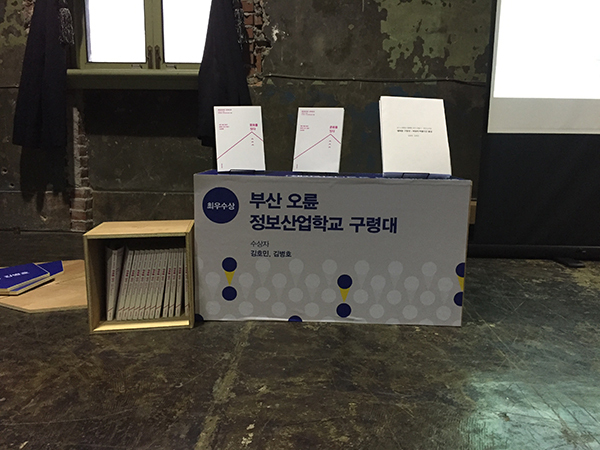 The event became more meaningful as Professor Kim Hong-sik, the leader of Poly.m.ur Architectural Firm and the father of director Kim Ho-min, came to listen to the presentation of Kim Ho-min. After about an hour of presentation, it was also a great opportunity to experience the heightened interest in architecture with questions asked by the visitors. 10월 21일 오후 한 시부터 폴리머에서 오픈 스튜디오 행사가 있었습니다. 사무실 내부를 처음으로 일반인에게 공개하는 자리였는데 두 아이와 같이 오신 방송국 프로듀서, 시행사 대표님을 비롯해서 건축과 학생들과 건축 사무소를 막 시작한 분들까지 다양한 분들이 방문하셨습니다. 또한 폴리머건축사무소 대표이자 김호민 소장님의 부친이기도 하신 김홍식 교수님께서 오셔서 소장님의 발표를 들으신 뜻 깊은 자리였습니다. 대략 한 시간 정도 발표 후에는 다양한 질문들로 건축에 대한 높아진 관심을 몸소 체험할 수 있던 기회이기도 했습니다. 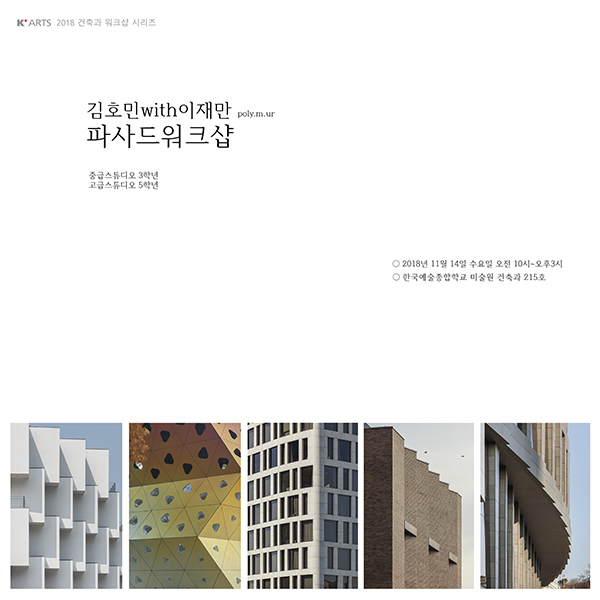 Director Kim Ho-min has given a presentation at the regular seminar of the Institute of Architectural City Theory in Seoul National University. This seminar is a monthly seminar led by Professor Baek Jin and is held under the participation of researchers of master and doctor’s course, where theorists and architects freely present and discuss their thoughts. 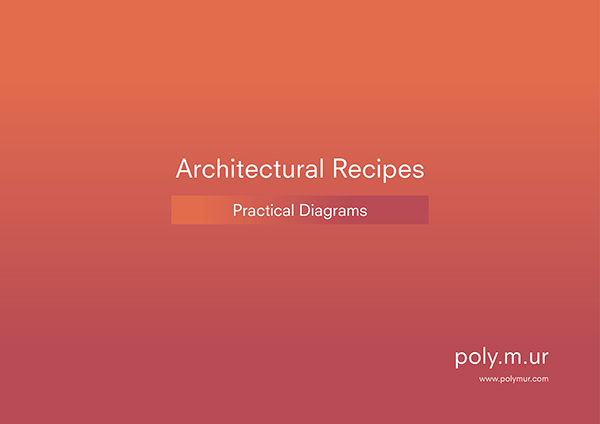 Director Kim Ho-min announced a particular design methodology, which Poly.m.ur has been investigating for the last ten years, with other Poly.m.ur projects under the title of “Recipe of Architecture”. He says that there are two ways of expressing: intuition and rationality. Architects use both of these ways in designing. However, intuition is tacit in schools and difficult to explain logically, compared to rationality which is intensively learned in the design curriculum and is easy to explain. Principles such as form, colors, atmosphere, and methodology are crucial in architecture, but all of them belong to intuition, which becomes a problem. So, we are investigating how we can explain intuition in a better way by analogizing architecture with food. In this process, there was a heated debate about the conflict between the efforts to protect one’s identity as an artist and the efforts to be responsible for the society as an architect when encountering the problem of how to design and construct by relying on his/her personal ability and experience. 서울대학교 백진 교수님 건축도시이론연구실 정기 세미나에서 김호민 소장님의 발표가 있었습니다. 백진 교수님께서 지도하는 석, 박사 과정 연구생들의 참여 하에 개최하는 월례 세미나로 이론가와 건축가 한 분씩 발표 후 자유롭게 대화하고 토론하는 자리입니다. 김호민 소장님은 ‘건축의 레시피’ 라는 제목 하에 디자인 방법론을 중심으로 지난 10년간 고민하고 탐구한 내용을 폴리머의 프로젝트들과 함께 발표했습니다. 사람에게는 직관과 합리라는 두 가지 표현방법이 있다고 합니다. 건축가도 설계에 이 두 가지를 모두 사용하는데 합리는 교육 과정에서 집중적으로 배우기 때문에 디자인을 설명하기 쉽지만, 직관은 학교에서도 암묵적으로 다룰 뿐 논리적으로 설명하기 어렵습니다. 형태, 색, 분위기, 방법론 등 건축에서 매우 중요하지만 설명하기 어려운 특성들이 모두 여기에 속하는데 건축을 요리에 유추함으로써 이들을 설명하고 발전시킬 수 있을지 실험 중입니다. 또한 어떻게 디자인하고 만들어야 하는 문제에 부딪칠 때마다 각자 개인의 능력과 경험에 의존해야 하는 건축사무소의 현실에서 건축가로서 당연히 지녀야 할 사회에 대한 책임, 한편 작가로서의 정체성을 지키기 위해 필요한 노력 사이에서 생기는 갈등에 대해서도 열띤 토론이 있었습니다. The exhibition “Inside Pyong-yang”, which is the highlight of 2018 Paju Architecture Culture Festival and has been prepared since this spring, is currently being held. It was not easy just a year or two ago to see the pictures of the capital city of the closest country from us, Pyongyang. Oliver Wainwright, a journalist and photographer of the Guardian, has visited to Pyongyang with personal interest after watching the Venice Biennale Korean Pavilion. 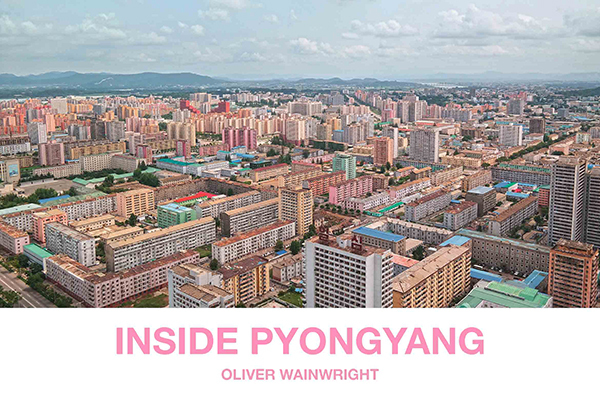 In a short period of time, we aimed to show the closed architectural and urban planning ambitions and nationalistic monuments of North Korea which are hard for South Koreans to encounter, in the view of architectural critic and journalist Oliver Wainwright. Since 1953, Pyongyang has been carrying out reconstruction projects to strengthen and show off Kim Il-sung’s self-interest and at the same time remove the traces of the Korean War. In order to achieve their aims in these reconstruction projects, Pyongyang has utilized the large monuments and spaces. Also, few ultra-legal or extremely uneconomical symbolic places which are not realistically feasible in capitalist societies were constructed in Pyongyang. If the architectural space of North Korea had been a symbol of such ideas before Kim Jong-un, it said to be another development direction since Kim Jong-un took office. Under the slogan, “Let’s turn the whole country into an amusement park for socialism,” Kim Jong-un calls for visually flamboyant, grand architecture, which he uses for his dictatorship over the crowd. The author believes that this three-week exhibition will allow the visitors to stroll through the mysterious city, from the high-rise residence house (apartment) to the newly built athletics stadium, which has been difficult to access from any overseas trips. The exhibition will be continued at the lobby of Seoul City Hall from 4th to 19th of October. 올 봄부터 준비했던 파주건축문화제 2018 의 하이라이트인 ‘인사이드 평양’ 전시회가 열리고 있습니다. 가장 가까우면서도 먼 나라인 북한의 수도 평양의 사진들을 접하는 것은 불과 1,2년 전만해도 쉬운 일이 아니었습니다. 영국 가디언지의 저널리스트이자 사진작가로 활동 중인 올리버 웨인라이트 씨는 베니스 비엔날레 한국관을 보고 개인적인 관심이 생겨 평양을 찾게 되었습니다. 단 일주일간의 체류 기간이었지만 우리가 지금까지 접하기 힘들었던 폐쇄적인 북한 고유의 건축적 그리고 도시계획적 야망과 국가주의적 기념물들을 건축평론가이자 저널리시트인 올리버 웨인라이트의 시각으로 보여주고자 했습니다. 1953년부터 평양은 김일성의 주체사상을 강화 및 과시하고, 동시에 한국전쟁의 흔적을 지우고자 재건사업을 진행하고 있는데 이러한 재건 사업에서 목적을 이루기 위하여 거대한 기념비들과 이들을 연결하는 대형 공간 축들을 활발하게 활용했다고 합니다. 또한 자본주의 사회에서는 현실적으로 구현이 불가능한, 초법적이거나 지극히 비경제적인 상징 공간들이 다수 구축되었음을 확인할 수 있었다고도 합니다. 기존의 북한의 건축 공간이 그러한 사상의 상징으로 점철된 공간이었다면, 김정은의 집권 이후로는 또 다른 발전 방향을 제시하고 있다고 합니다. “전국을 사회주의의 놀이동산으로 만들자” 라는 슬로건 아래, 김정은은 시각적으로 화려하고 또 다른 의미에서 웅장한 건축물을 요구하며 이를 자신의 독재정권을 군중에게 주입하는 강력한 마취제로 활용하고 있다고 합니다. 광복로의 고층살림집(아파트)부터 새로이 조성된 육상 경기장까지, 3 주간의 전시회를 통해 관람객들은 그 어느 해외여행으로도 접하기 힘들었던 불가사의한 도시를 거닐 수 있을 것이라고 작가는 소개하고 있습니다. 10월 4일부터 19일까지는 자리를 옮겨 서울시청 1층 로비에서 전시를 계속할 예정입니다. For a month, in July, our team has conducted a nominated competition of an officetel located in the development area in Deok-i, Ilsan. We have aimed to design an efficient yet unique residential complex in line with the brief to create a local landmark. The main idea of the design was to provide the necessary public space while also attracting passengers and visitors for a commercial benefit by emptying the corner of the intersection. Since the corners of the intersections are visually exposed, it is common to design full of commercial buildings, but we rather tried to empty them to create a square and provide the green space with the shade. As a result of the open corner, the plan could have a shape of a parallelogram as a whole. Functionally, we allocated commercial facilities for rent on the 1st to 5th floor and officetels on the 6th to 15th floor based on the briefing. By separating the vertical copper lines of housing and commerce, which ensures a pleasant residential environment, we aimed to compensate the disadvantages of a residential-commercial complex. Unfortunately, we were unlucky in the election, though we still received good comments, I would like to express my gratitude and congratulations to the head of the team Sun Ji-hye who was in charge for the design and product and our staff Cho Ye-jin and Kim Dong-young for drawing and creating diagrams. 7월 한 달 동안 일산 덕이지구 택지개발 내에 위치한 오피스텔 지명 현상설계를 진행했습니다. 지역의 랜드마크를 만들어달라는 브리프에 맞춰 효율적이면서도 독특한 외관의 주상복합 건물을 설계하는 것을 목표로 설정했습니다. 디자인의 주된 아이디어는 교차로의 코너를 비움으로써 공공에 필요한 공간을 제공하면서도 상업적으로는 행인과 방문객들을 끌어들일 수 있는 역할을 겸하게 함으로써 윈윈의 전략을 편 것이었습니다. 교차로의 코너는 시각적으로 노출이 많은 만큼 상업 건물의 경우 꽉 채워서 설계하는 것이 일반적입니다만 우리는 오히려 이를 비움으로써 광장을 조성하고 도시에 부족한 그늘이 짙은 녹지 공원을 제안했습니다. 결과적으로 코너에 비워진 공지 덕분에 전체적으로 평행사변형의 평면을 갖는 볼륨이 되었고, 기능적으로는 브리프에 따라 1~5 층에 임대용 상업시설과 6~15 층에 오피스텔을 배치했습니다. 단 주거와 상업의 수직 동선을 분리하고 각각 별도의 동선으로 처리하여 쾌적한 주거 환경을 확보함으로써 주상복합건물의 단점을 보완하고자 했습니다. 결과적으로 당선이 되지는 못해서 아쉬웠지만 좋은 평을 들었던 프로젝트였습니다. 디자인과 결과물을 도맡아 해준 선지혜 팀장과 도면과 다이어그램을 도맡았던 조예진 사원과 김동영 사원에게 감사와 축하의 말씀을 전합니다. ‘Forest of Wisdom’ to be built in Sejong City is the latest project by poly.m.ur that is currently underway. 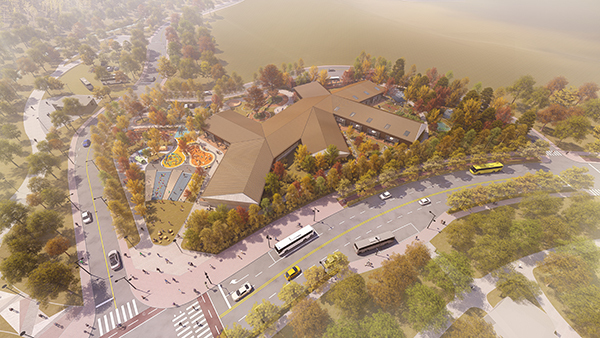 Launched by Paju Book City Foundation in 2014 in Paju Book City, ‘Forest of Wisdom’ is a popular multi-purpose cultural venue featuring books as a medium that attracts more than 400000 visitors annually. Mark One Avenue ( 3 floors in the basement and 12 floors above the ground) is a brand new retail complex built within the Urban Atrium located in the cultural and commercial street of Zone 2-4 in Sejong City, and 4th and 5th floors spanning 750 pyong are reserved for the ‘Sejong Forest of Wisdom’, which is scheduled to open its collection of almost 100000 copies of books to the public in February of 2019. Sejong City is a special self-governing city and has steadily grown into a prominent city with the ratio of residents aged 40 years old or younger above the national average. At the same time, residents have expressed the greatest need for quality cultural space that can benefit the whole family, especially young children. Plan for the ‘Forest of Wisdom’ began to take shape to satisfy growing needs and desire for cultural enrichment and promises to deliver a unique playground of books where families, friends and children can have fun with books and the nature by infusing the concepts of book store and library. One of notable design features of the ‘Forest of Wisdom’ is a floor-to-ceiling glass wall on the left side of the entrance that beckons visitors to be instantly transformed into a playground of books where children and parents, books and toys and forest and nature can unite in harmony. Large barrel-shaped bookshelves in the main hall were designed to inspire the feeling of crawling into hollow tree trunks and curl up with books while taking a stroll through the forest. People typically feel cozy and comfortable in tight and corner spaces, and the barrels were made to resemble tree trunks using wood as finishing material, and they were placed to make it easier for visitors to move around and feel closer to books. Shelves in different heights lined the interior of the barrels, and children can sprawl comfortably on the floor with books while adults find quiet place to read. Visitors who wish to read in peace and quiet can grab a seat at large desks located along the hallways of the back of 4th and 5th floors, while meeting rooms underneath the 4th floor staircase await readers who wish to engage in heated debates. Specialty bookstore is planned on the 5th floor to cater to visitors with need for special and rare books. Inspired by its namesake of King Sejong for whom the city was named after, Hangul-themed design ideas are generously adopted. Project is headed by Jihae Sun(Team Leader), Yejin Cho(Staff) and Homin Kim(Director) of poly.m.ur and is slated to be completed in early 2019. 세종시에 새롭게 들어서는 ‘지혜의숲’ 디자인을 폴리머가 진행하고 있습니다. 책을 매개로 하는 복합문화공간인 지혜의숲은 파주출판문화재단이 2014 년 파주출판도시에 처음 조성해 운영 중인 공간으로 연간 40만 명 이상이 찾는 명소가 되었습니다. 세종지혜의숲은 세종시 2-4생활권 문화상업거리 어반아트리움 내 신축 상업시설인 마크원애비뉴(지하 3층, 지상 12층)의 4-5층예 계획 중입니다. 총 750평 규모로 조성되어 2019년 2월에 개관할 예정으로 장서 10만 권을 보유할 예정입니다. 세종시는 특별자치시로 출범한 후 인구가 지속적으로 증가해 현재 40 세 이하 젊은 세대가 전국 평균을 웃도는 도시로 성장했습니다. 특히 어린 자녀들과 함께 즐길 수 있는 문화 공간에 대한 욕구는 전국 최고입니다. 세종지혜의숲은 높아진 시민들의 문화적 욕구에 부흥하기 위해 기획되었고, 서점과 도서관을 결합한 공간으로 가족과 연인, 책과 어린이, 숲과 자연히 함께 어우러지는 책의 놀이터를 표방하고 있습니다. 디자인의 특징으로는 방문객들이 입구를 들어오며 좌측의 전면 유리를 통해 보이는 모습을 통해 색다른 공간임을 직감하는데 어린이와 부모님, 책과 장난감, 숲과 자연이 함께 어우러진, 책 놀이터로 초대하는 공간입니다. 홀에 들어서면 만나는 거대한 원통형 서가들은 숲 속을 산책하다 나무 기둥 속으로 들어가 책을 읽는 모습을 상상하며 디자인했습니다. 사람들은 결국 구석이나 모퉁이로 들어갔을 때 더 편안함을 느끼기 마련인데 원통은 밖을 나무재질로 마감해 나무의 이미지를 살리고, 사람들이 숲 속의 작은 서가들 사이를 지나고 머무르며 책과 더 가까워지기를 의도했습니다. 각각의 내부는 서가들로 각각의 높이가 달라 어린이들은 바닥에 편하게 앉아 책을 읽고 성인들은 조용한 곳에서 독서할 수 있도록 배려했습니다. 또한 조용하게 독서하고 싶은 방문객들을 위해 4,5층 뒤편의 복도는 큰 책상들을 배치했으며 토론이나 소모임을 갖고 싶어하는 독자들은 4층 계단 밑 공간에 미팅룸을 빌려 실컷 떠들 수 있습니다. 한편 5층 마지막 공간은 특화된 책들을 다루는 서점으로 책을 구입하고 싶어하는 방문객들을 위한 곳으로 전문서적을 판매하는 서점이 있습니다. 공간 전체는 세종시라는 점을 고려해 곳곳에 한글을 모티브로 한 디자인들을 도입했으며 폴리머의 선지혜 팀장, 조예진 사원과 김호민 소장이 참여하여 내년 초에 일반에 공개될 예정입니다. 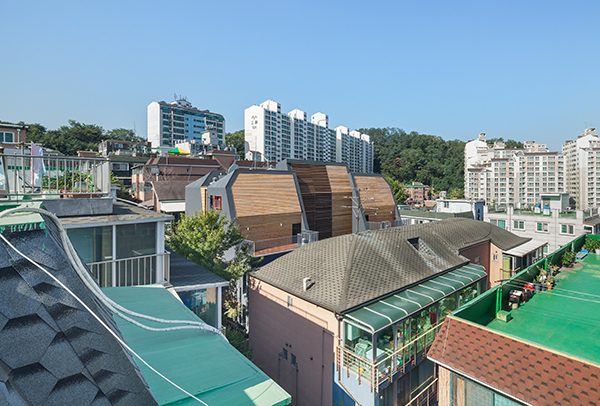 ‘Apartments’ is a type of architecture that traces its origin in the Western Civilization but evolved to carve a unique identity in Korea through the course of the country’s modernization. Suffocating landscape of Seoul characterized by densely populated apartment buildings along the Han River makes one envious of urban scenery of London or Tokyo that effortlessly blends skyscrapers and low-rise buildings, but apartments in Korea is such an integral part of the urban landscape and it may be safe to say that they demand proper recognition and acceptance as architecture that represent Korea. After all, it will be hard to find in developed countries than Korea where a building worth more than KRW 40 million per 3.3m2 can be constructed by getting away with employing cost-cutting methods such as hand-painting the exterior by workers using rope access instead of scaffolding. Structure is built using forms that are individually catalogued where concrete is poured at the site. When one layer (floor) is cured the next day, work for the next layer (floor) is repeated. 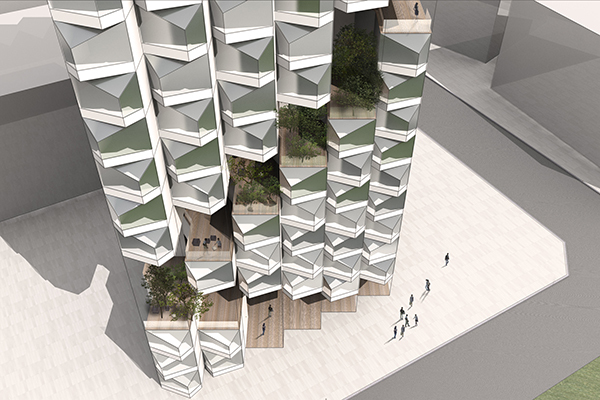 For the exterior of the towering apartments, lightweight aluminum formword is used. Finishing the rough concrete walls with wallpaper that is glued only at the top and bottom and stretched to cover the walls is another classic trick of apartment construction trade in Korea that epitomizes the way it secures needed quality without jeopardizing cost effectiveness. 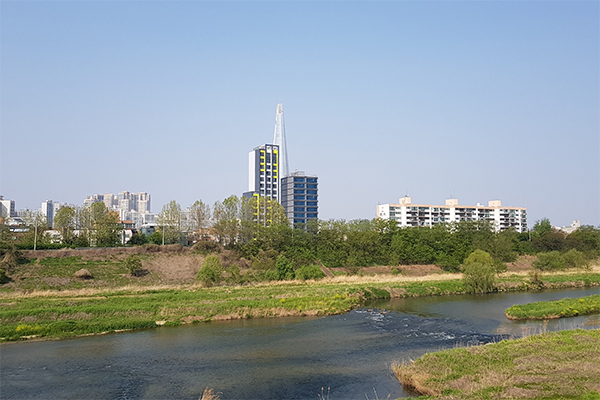 While apartment towers originated in Western Europe to serve the purpose of long-term public housing supplied directly by governments, public sector and construction conglomerates dominated the construction and sale of apartment in buildings in Korea. Korea as a nation zealously pursuing economic development in the 60s and 70s simply did not have the fiscal means to invest in proper housing development, and they enlisted the participation of companies in the private sector to address bulging problems that were accompanying rapid urbanization. Enabling the system that allowed construction companies to sell apartment units before the construction also allowed them to raise capital at an incredibly low cost. 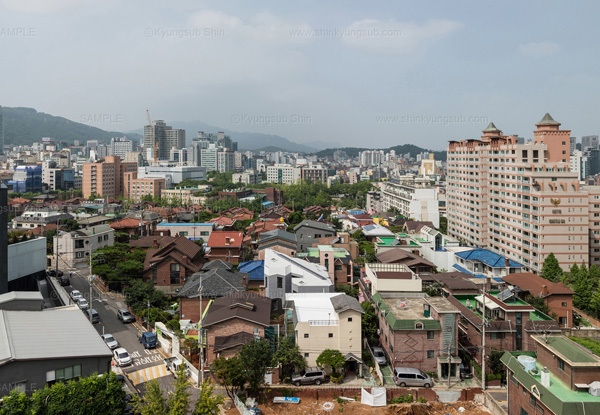 Apartments became the most effective way to increase the wealth of the Korean middle class, and this system intended for the nation, corporations, and the public to share the wealth created by real estate became a phenomenon but with grave limitations. Incredible advancement of technology enabled apartments to be built faster and cheaper than ever before, but their original purpose of being effective and affordable housing for the working people in the city is no longer recognized in Korea as it was replaced with becoming a vehicle exploited by the middle class to increase their wealth without labor. 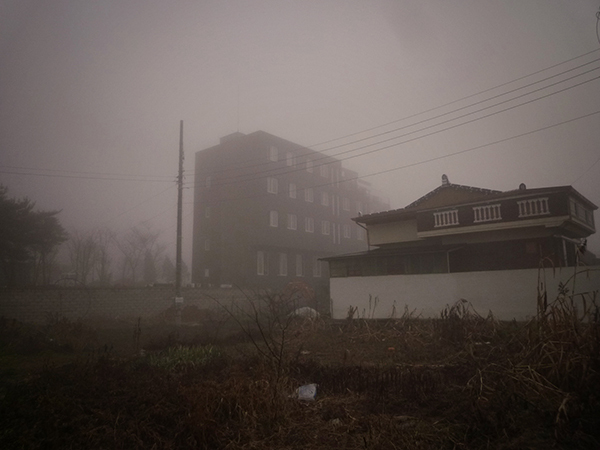 The fact that the problem of apartment buildings managed by the government as public housing deteriorating into slums common in cities in developed countries is not observed in Korea can be regarded as a silver lining, but the government’s neglect of its responsibility to address the housing needs of the working class is clearly visible. That is one of the reasons public housing programs is yet to proliferate in Korea. System of facilitating the sale of apartment units prior to construction is still sanctioned in Korea where apartments turned into a commodity with interior as recognizable features, and it may serve as a useful tool that chronicles the changes of the people’s lifestyle in Korea for over 40 years. Companies lure customers using ‘Model House’ instead of actual apartment as a marketing tool by closely addressing the needs of the customers. Once the construction is completed, pestering queries and complaints are addressed and compiled to be reflected onto the next project. 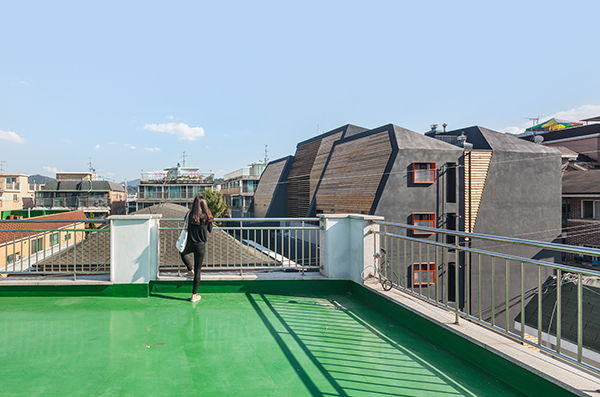 Apartments in Korea is the organic by-product of this creative process that went on for almost 40 years, and as much as the exterior, color, or pattern, floor plans of the latest apartments are significantly different from the apartments in the 90s. Most surprising aspect is that such data has been compiled into an industry manual of public housing know-how by joint effort of construction conglomerates. The intention would obviously be commercial gains, but similar effort wouldn’t be observed in Europe where apartment construction is mainly led as a public initiative. The manual include highly specific and vast data on apartment building construction from locations of electric switches and outlets in every room to the height and width of doors. 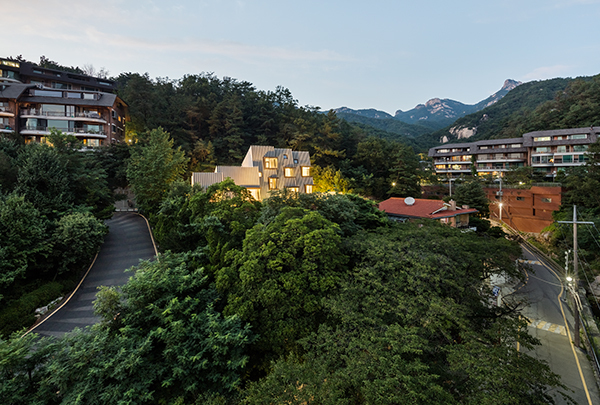 Recognizing apartment buildings as a legitimate agent of urban landscaping is a tall order to serve as an architect, but they have served as a staple of Korean lifestyle for the past 40 years and knowledge and wisdom they came to embrace may well be utilized and exploited. ‘아파트’ 는 비록 서구에서 유래했지만 대한민국의 근대화 과정을 통해 진화된 독특한 유형의 건축물이다. 서울이 점점 더 아파트로 꽉 들어차 답답한 한강변을 보면서 낮은 건물과 높은 건물들이 조화롭게 어울리는 런던이나 도쿄가 부럽기도 하지만 이제는 아파트를 대한민국을 상징하는 건축물로 인정하는 게 낫지 않을까 싶다. 외부에 비계를 매지 않고 비용 절감을 위해 동아줄에 의존해 사람이 직접 페인트를 칠하는 공법으로 평당 4천 만원 이상의 건축물을 만드는 나라는 우리 외에는 드물 것이다. 거푸집 한 장 한 장에 번호를 붙여서 콘크리트 타설 후 다음날 바로 올리고 외부 형틀은 가벼운 알루미늄 폼으로 제작해 타워로 올리는 것도 마찬가지다. 벽지의 위 아래에만 풀을 먹이고 당겨 붙여서 골조 벽의 거친 마감을 커버하는 내부 마감도 가장 저렴하면서도 일정한 퀄러티를 확보하기 위한 대표적인 예다. 한편 아파트의 원조인 서구 유럽은 대부분 장기임대주택 형식으로 국가가 직접 공급했는데 우리의 경우는 민간 혹은 대기업의 손에 맡겨졌다는 점이 큰 차이다. 6,70 년대 산업개발에 박차를 가하던 정부에 돈이 없어서이기도 했지만 급속한 도시화에 따른 문제 해결을 위해 사기업들이 참여하도록 한 것이다. 또한 실제로 짓지 않고 미리 분양할 수 있게 함으로써 자본의 축적을 가능하게 했다. 한편 중산층에게는 아파트를 통해 큰 돈을 벌 수 있게 해줌으로써 국가와 기업, 개인이 모두 부동산의 혜택을 누릴 수 있게 한 것이 또 다른 특징이자 한계였다. 따라서 건축 역사상 가장 빠르고 저렴하게 지을 수 있는 아파트가 서민들의 주거 문제를 해결하는 대신 중산층의 자본증식을 위한 수단으로 대체되었다는 점이 달랐다. 덕분에 서구에서 흔히 겪고 있는 공동주택의 슬럼화 문제는 피할 수 있었지만 정작 국가가 담당해야 했던 빈곤층의 주거 문제는 방치되었다. 지금까지도 우리나라에서 공공임대주택이 정착하지 못하고 있는 이유 중 하나다. 지금까지도 허용되고 있는 선분양 제도는 짓기 전에 미리 구입할 수 있는 제도로서 아파트가 인테리어 중심으로 급격히 상품화되어 버린 지난 40 년 동안 대한민국이 축적해온 주거 방식의 변화를 추적해볼 수 있는 장점이 있다. 모델하우스를 지어서 팔기 위해 소비자의 의견에 귀 기울여야 하고 입주 후에도 끊임없이 민원에 시달리면서 쌓은 노하우는 그 다음 사업의 설계 과정에 반영되는 사이클을 밟았다. 이 과정을 40 년간 반복하면서 만들어진 결과물이 바로 대한민국의 아파트인데 평면 구조만 하더라도 90 년대와 현재는 외관이나 색, 패턴만큼 많이 달라졌다. 가장 놀라운 점은 대기업들이 이것을 매뉴얼로 정리하여 공동주택의 노하우로 정리했다는 것이다. 이것은 물론 상업적인 목적에 의한 것이겠지만 오히려 국가 주도로 이루어지는 유럽에서는 찾아보기 어렵다. 매뉴얼에 정리된 내용들은 방에 있는 스위치, 콘센트의 위치, 문의 크기와 높이까지 규정할 정도로 실로 디테일하고 방대하다. 건축가로서 솔직히 아파트를 우리 도시 환경을 구성하는 주체로 인정하고 싶지 않기도 하지만 지난 40 년 동안 대한민국 주거 문화를 반영해온 지식의 일부로 받아들이고 싶분 활용해야 한다고 생각한다. I spent a total of 14 years learning and training architectural design both in and out of classroom. Since that time was split equally in Korea and the U.K. exposing me to two drastically different educational systems of Asia and Europe, I became fully aware of the strengths and weaknesses of the two worlds. In other words, while studying at Seoul National University and working for Daewoo Engineering & Construction in Korea prepared me with the fundamental and practical knowledge of architecture, learning and training at the AA School and F.O.A. paved philosophical and conceptual core of my career as an architect. If I hadn’t prepared myself well by completing rigorous coursework and butting heads with workmen at sites in Korea before pursuing further education in the U.K., my foundation could have been easily crumbled under the overpowering dominance of conceptual design inspired by overly philosophical and conceptual thoughts. I relied upon the practical and hands-on knowledge I acquired in Korea to help me materialize the highly experimental and conceptual knowledge offered by the western culture. Point I’m trying to make by sharing different ways I learned architectural design is that the most valuable lesson I learned was how to develop and apply methodologies that are clear and concrete. Any attempt to apply philosophical and scientific concepts to architectural design is bound to hit a snag as soon as they are conceived. The process of materializing concepts out of our heads and into physical existence is extremely intricate and challenging. The more abstract the concepts are, it would take greater time and effort for men to process and understand those concepts to make them more practical and applicable. If we suppose the attitude of embracing our world as it is by respecting its philosophical individuality and diversity as a characteristic of the Eastern culture, then their unpretentious compulsion to learn and conquer our world by using the power of logic and reasoning would be a force that sustained dominating presence of the Western culture. Take an attitude toward the nature, for one. As a student of architecture, I read and heard the word ‘nature’ being referenced everywhere, but I never felt like any architect shared a clear concept of what he meant by nature. It is certainly a competitive advantage of the Asian culture to be able to respect and revere the nature, but the way we incorporate nature into architecture with excessive conceptual and abstract nature became a hindrance that held back its development in the region. Prior to the industrialization, there was still room in our civilization for architecture to retain nature as an important architectural element. But rapid urbanization no longer made it so effortless. Contemporary architecture attempted to restore this symbiotic relationship between men and nature featuring architects who turned their attention to concepts such as space, courtyard, or void. This attempt, however, was rather futile, because those concepts were still too abstract and conceptual and none of them really fully materialized with real-life application. 학교에서 받은 수업과 실무 경험을 포함해서 총 14년간 건축설계 교육을 받았다. 정확히 절반은 우리나라에서, 나머지 절반은 영국에서였는데 극단적으로 동서양의 다른 교육 방식을 모두 경험하면서 장단점까지 확실히 체득할 수 있었다. 서울대학교와 대우건설에서는 건축의 본질적이고 구체적인 점을 배웠다면 AA스쿨과 F.O.A에서는 추상적이고 개념적인 과정을 경험했다. 학교 작업실에서 밤을 새우며 작업하고 현장 인부들과 함께 땀 흘리던 경험이 없었다면 고도의 철학적 담론들과 추상적인 생각으로 개념적인 설계에 파고들면서 기본을 잃었을지 모른다. 또한 우리나라에서 경험한 실질적이고 실무적이며 구체적인 지식들이 없었다면 서구의 실험과 개념들은 허구에 불과했을 것이다. 결국 제일 중요한 교육은 구체적인 방법론에 있었다. 대부분 철학적이고 과학적인 개념을 설계에 구체적으로 적용하려고 하면 금세 난관에 부딪힌다. 그것을 디자인에 실제로 반영한다는 것은 난해한 일이기 때문이다. 지극히 추상적인 개념이라도 단순한 논리로 결과에 적용하는 과정을 체득하는 데는 상당한 시간과 노력이 필요하다. 만일 추상성을 그대로 받아들이는 동양 문화와의 차이를 인정한다면 단순 명쾌함이 바로 그들의 힘일지도 모른다. 예를 들면 자연에 대한 접근 방식에서도 그렇다. 공부할 때 자연이라는 단어를 입에 달고 살았지만 정작 그 개념은 모호했다. 그것을 동경하고 존중하는 문화는 뛰어났지만 추상적이고 관념적인 방식은 한계가 있었다. 전통 건축은 자연을 있는 그대로 내부에 끌어들이는 방식을 취할 수 있었지만 도시화를 거치며 더 이상 유효한 방법은 아니었다. 이에 공간이나 마당, 비어 있음을 강조하며 자연과의 관계를 회복하려 했지만 또 다른 추상성을 더할 뿐이었고 구체적인 사례로 발전하지 못했다. 싱그러운 5월의 일요일에 폴리머의 김호민 소장님 발표로 ‘누나’ 세미나가 있었습니다. 고기웅, 김호민, 양수인, 오영욱, 이치훈과 신경섭(건축사진작가)으로 구성된 젊은건축가 모임으로 지난 10 년간 친구이자 동료로서 서로 자극하고 끌어주며 각자의 위치에서 열심히 활동하고 있습니다. 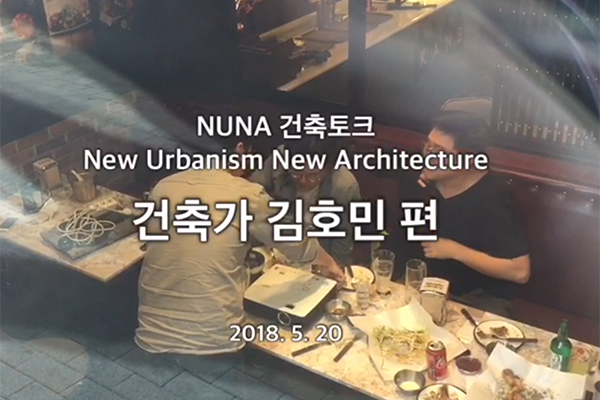 누나 (N.U.N.A)는 New Urbanism New Architecture의 약자로 멤버들이 자주 다니던 주점의 이름에서 시작되었다고 합니다. 두어 달에 한 번씩 시간 될 때 모여서 하는 누나 세미나는 멤버들이 한 사람씩 돌아가며 각자 주제를 정해 발표하고 난상 토론을 통해 진행합니다. 서로 가까운 사이이므로 감정 상하는 일 없이 막말도 불사하고 각자의 생각과 의견들을 나누고 주장할 수 있는 것이 큰 장점입니다. 토론이 어렵고 평론도 어렵다고 하는 우리 건축계에 이와 같은 자생적인 소모임들이 활성화되길 기대해봅니다. 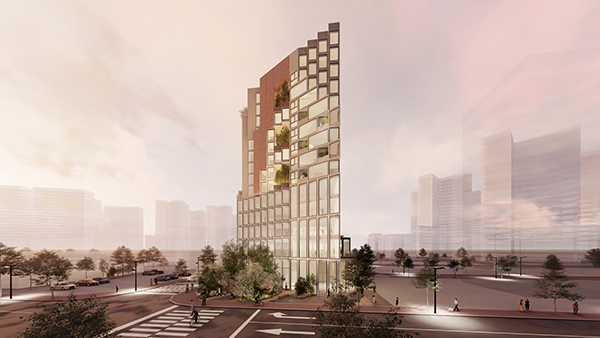 ‘Nahollo Apartment’, a project that began in the summer of 2015, is nearing its competition. Development projects involving public housing intended for sale and lease tend to pose one daunting challenge to architects: succumb to the constraints of maximum standardization and profitability expected of apartment buildings or dare to defy the mandate and accept the challenge head on. Architects by and large, including me, are compelled to choose the latter, and I decided to embrace the ‘Nahollo Apartment’ project not just as a challenge but also a chance to explore and expand my understanding of apartment residence. I began by first re-identifying the constraints associated with apartment buildings as a vast collection of knowledge and know-how accumulated as a result of countless trials and errors for the past 40 years or so. 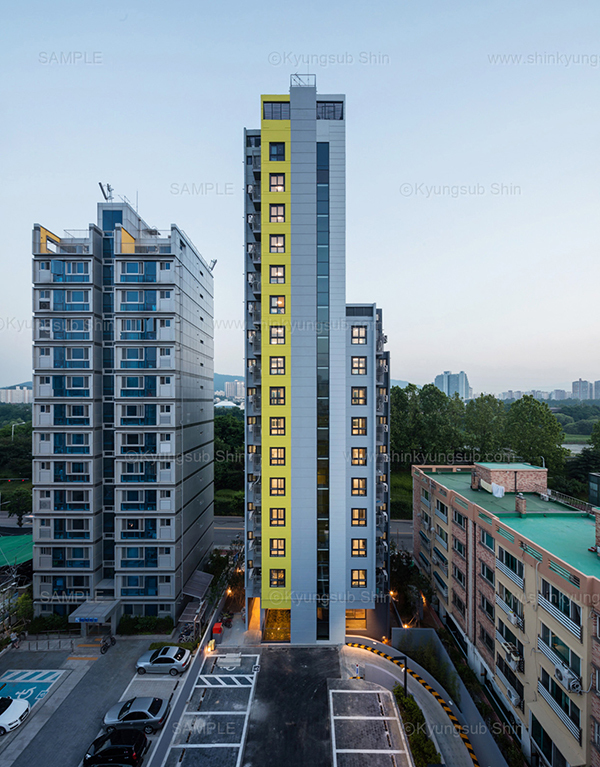 Apartment buildings are criticized for commercializing architecture, but they are a by-product created to fulfil our needs during the process of unique modernization and industrialization in Korea. Manuals construction conglomerates have compiled on apartment design and construction are surprisingly detailed and choreographed; not to mention specifications of rooms and finishing materials, every electric outlet and switch is strategically located. Our expertise on residential projects needed reinforcement, and we recognized the potential of such information to serve us as valuable know-how. Constraints set by pre-determined parameters such as cost efficiency considering the land price and feasibility and building regulation such as floor area ratio were rather challenging, but in-depth analysis of standard apartment floor plans provided insightful solutions. Overall frame was affected by the slant line requirement for daylight, but the form was put to an innovative use to serve as private gardens for apartment units. Attempt to design a garden on the roof of apartment buildings often fail because it is prone to neglect or abuse, but it still entailed significant pondering and exploration to privatize a space that is supposed to be public. Recalling the experience of SH Housing project in Sadang-dong, Seoul where I managed to squeeze a courtyard and terrace for residents into the design plan that seemed improbable only to be disappointed later learning that the carefully designed space was being left deteriorated and abandoned due to maintenance issues, my approach to the rooftop garden required processing of a multitude of factors and feelings. Roof gardens envisioned by Le Corbusier may be ideal, but no longer feasible as even the littlest time to enjoy the space is regarded as a luxury for the perpetually busy modern-day people. When the decision was made to limit the roof top landscape for private use, I was ready to face the criticism of adopting an idea that was too commercial and profit-oriented. The plan resulted in a limited number of people granted with access to the space people take for granted as public use, but it may shed a new light on the issue of effective and efficient use of apartment rooftop space. Will the fate of ‘Nahollo Apartment’ follow the same path of deterioration and abandonment? It remains to be seen. 2015년 여름 설계를 시작했던 삼전동 ‘나홀로’ 아파트의 완공을 앞두고 있습니다. 분양을 주 목적으로 하는 공동주택은 건축가에게 언제나 큰 도전일 수밖에 없습니다. 극도로 표준화되고 상품화된 아파트에 굴복할 것인지 아니면 이에 비판하고 맞서 싸울 것인지의 기로에 서게 됩니다. 저를 포함한 건축가들은 주로 후자를 택하게 됩니다만 이번엔 무엇을 배울지 고민하는 기회로 삼아보았습니다. 지난 40 년간 수많은 시행착오들을 거쳐 축적된 지식이자 노하우로 보는 관점으로 전환해보았습니다. 건축을 상품화한다는 비판에도 불구하고 근대화를 거치며 독특한 산업 사회를 이루는 과정에서 얻은 산물로 보는 것입니다. 놀랍게도 대기업 건설사들이 정리해놓은 아파트 설계 메뉴얼은 방의 크기부터 각종 마감재는 말할 것도 없고, 전기 콘센트, 스위치 위치까지 포함할 정도로 상세합니다. 우리에게 부족한 주거 설계의 경험을 보완해줄 수 있는 노하우로 활용할 수 있는 가능성을 엿보았습니다. 비싼 땅값과 사업성을 고려해 제한된 높이와 규모 내에서 용적률을 모두 만족시켜야 하는 빠듯한 조건이었지만 표준 아파트의 평면을 심도 깊게 공부해 적용하는 동시에 일조권 사선 제한으로 만들어진 매스의 형태를 활용하여 세대의 개인 정원으로 온전히 할애해보는 시도를 했습니다. 방치되기 쉬운 옥상 정원을 개별 세대를 위한 정원으로 사유화한 것인데 과연 옳은가에 대한 질문과 많은 고민을 했습니다. 전에 진행했던 사당동의 에스에스에이치 하우징에서 계획이 거의 불가능했던 중정과 테라스를 주민들을 위해 제공했지만 관리 문제로 점점 더 찾지 않는 공간이 되어가는 걸 보며 많은 것을 느끼게 됐습니다. 르 코르뷔지에의 옥상 정원은 이상적이었지만 이를 즐기기에 현대인들은 너무 바쁜지 모르겠습니다. 비록 지극히 상업적인 결정이란 비판을 감수하고서라도 옥상 조경을 사적 영역으로 할애하는 쪽으로 방향을 전환했습니다. 결국은 소수의 인원이 점유해버린다는 단점에도 불구하고 그 어느 누구도 사용하지 않아서 방치되어 가는 아파트의 옥상 정원에 대한 대안이 될 수 있을지 앞으로 지켜봐야할 일입니다. 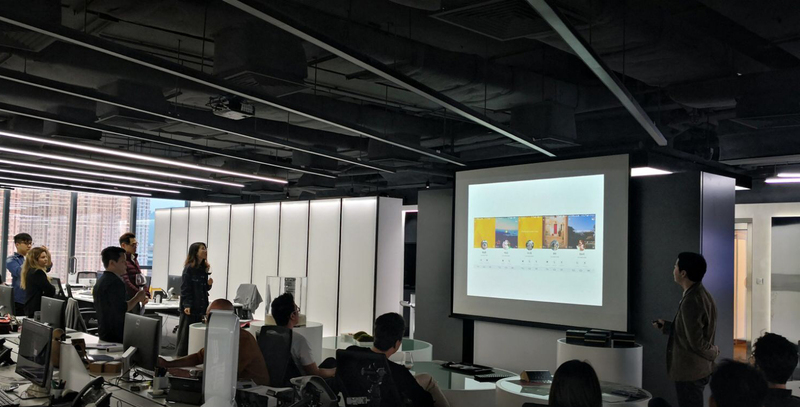 AAsian Seminar is a venue for leading architects in Asia to connect and share their architectural visions and practices, and Homin Kim of Poly.m.ur was a guest and speaker for presentation and panel discussion on design methodology at the latest meeting held at the QUAD studio in Hong Kong. Although they are all practicing architecture in the region of Asia, architects who participated in the seminar differed in terms of scale and nature of projects they take on, work process, and other aspects. However, one thing that brought them together was the fact that their passion was designing and translating their virtual visions into reality through architecture. Architects work to transform an empty space into a tangible object, which makes it inevitable to deal with the ultimate problem of “how”. How nice would it be if there was a tried and tested “design methodology” that offers easy guide to the solutions architects so desperately seek? If such universally accepted methodology would exist, then how would it work: like spells casted by magicians or open source code shared and created by everyone like music sampling? 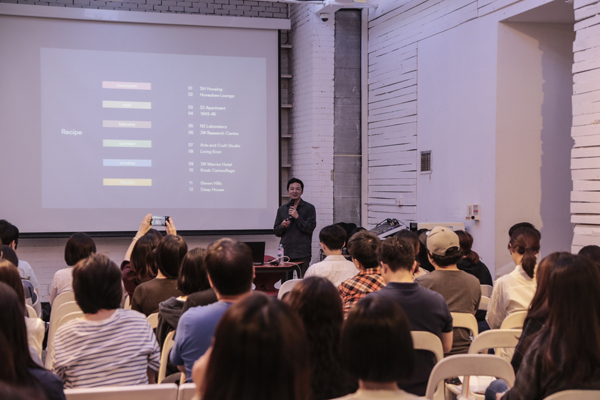 Homin Kim presented Polymer’s projects of the last decade for a heated debate held under the theme of “Design Methodology” during the 2-day long seminar held at the QUAD studio in Hong Kong. AAsian Seminar led by Asian architects who completed AA School during the 2000s is scheduled to be held this fall in Singapore. 홍콩의 쿼드 스튜디오에서 아시아 건축 설계 사무소들의 교류의 일환으로 폴리머의 김호민 소장님 발표와 디자인 방법론에 대한 열띤 토론이 있었습니다. 아시아에서 활동한다는 공통점 외에는 프로젝트의 규모와 성격, 일하는 방식 등이 모두 다르겠지만 각자 책상 앞에 앉아 가상의 세계에서 실제로 벌어질 일을 꿈꾸며 설계하는 것은 매한가지일 것입니다. 건축가는 빈 땅으로부터 유를 창조하는 직업이므로 매번 어떻게 란 문제에 봉착할 수 밖에 없습니다. 한편 우리가 찾고자 하는 결과물을 얻기 위해서는 디자인 방법론이란 게 있으면 얼마나 좋을까 생각하게 됩니다. 그런데 만일 그런 방법론이 있다면 그건 마술사의 마법으로 봐야할까요 아니면 대중 음악을 샘플링해서 만드는 것처럼 우리 모두가 공유하고 같이 만들어가는 오픈소스로 볼 수 있을까요? 지난 10년간 폴리머가 만들었던 결과물들을 중심으로 디자인 방법론이란 주제 하에 1박 2일동안 홍콩의 쿼드 스튜디오에서 열띤 토론을 진행했습니다. 2000 년대 AA school을 졸업한 아시아 건축가들을 중심으로 진행하는 AAsian Seminar는 올 가을 싱가폴에서 개최할 예정입니다. 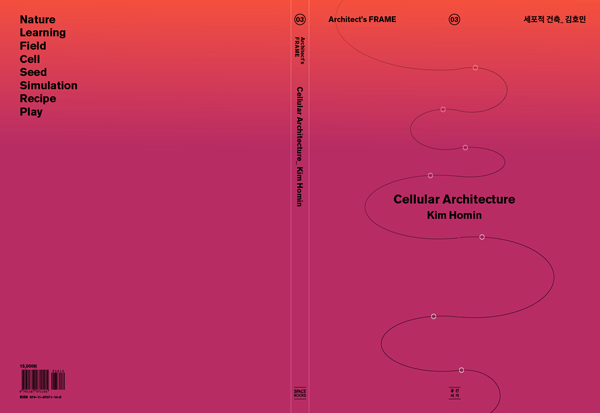 Homin Kim from poly.m.ur will give a talk at QUAD design studio in Hong Kong and discuss about the future of Architecture. Please join on Wednesday 11th of April at the Octagon, 6 Sha Tsui Road, Tsuen Wan, New Territories, Hong Kong. 폴리머 김호민 소장님이 홍콩에 위치한 쿼드 스튜디오에서 건축 설계의 레시피 즉 디자인 방법론을 주제로 강의를 합니다. 디자인 방법론은 프로젝트마다 매번 달리 만들어지고 새롭게 고안되어야 하는 것인지 혹은 마치 쉐프들의 레시피처럼 그 시대가 공유하고 있는 방법론에 약간의 변화들을 가미해서 만들어지는 것인지에 대한 고민을 폴리머가 지난 10년 동안 진행해왔던 작업들을 중심으로 얘기하고 토의할 예정입니다. Poly.m.ur is looking for exceptional, an enthusiastic individual to join its team of architects. There is an opportunity within diverse projects for both architectural assistant & qualified architect with a strong track record in cultural, retail, office buildings or competition. Required are Excellent design skills, Interest in experimentation and design challenges, Proven construction detailing, Expertise in Rhino and Autocad, rendering skills (ie.twinmotion), Fluent in spoken Korean. Expertise in Revit would be a plus. Please post CV, examples of work and cover letter either digitally (pdf, max 6 MB) to info@polymur.com. Poly.m.ur is an equal opportunities employer. 건축사무소 폴리머에서 3-5 년의 경력직 직원을 채용합니다. 기본, 실시설계 및 현상설계 등 다양한 분야의 건축사무소 경험자를 우대합니다. 관심 있으신 분은 포트폴리오 pdf형식(6메가 이내)으로 info@poly.m.ur.com으로 보내주시면 개별적으로 연락드리고 면접을 진행합니다. Deep House and SHHousing are among the fifteen nominees of the Archidaily’s 2018 Building of the Year Awards. The ethos behind the Award is simple: readers vote to decide the best quality architecture. Together, over the next 2 weeks, they will nominate and subsequently reward the best architecture published on the platform in 2017. https://boty.archdaily.com/us/2018/candidates/nrm/58f5946be58ecea6420000bc?utm_source=offices&utm_medium=email&utm_campaign=nominate.The jury will announce the winners on January 31st at 10:00AM EST. 2018 년 새해가 밝았습니다. 올해는 건축사무소 폴리머가 서울에 사무실을 개소한 지 10 년 째가 되는 해입니다. 작년에 공간서가에서 세포적 건축을 출간한 후 향후 10 년의 계획을 건축가 한 개인의 사무소로부터 디자인 그룹으로 전환하기로 한 바 있습니다. 그동안 쌓아온 경험과 능력으로 한 건축가의 능력에 의존하는 것으로부터 팀으로 확장할 준비가 되었다고 생각합니다. 또한 미래의 건축 설계 사무소에서 일하는 방식에 대한 대안이 될 수 있기를 희망하는 바입니다. 앞으로 10 년 후에는 폴리머란 이름처럼 여러 사람이 함께 일하고 시너지를 냄으로써 더 즐겁고 재미있게 일할 수 있는 사무소가 되어 있을 것입니다. 폴리머가 디자인하고 이안건설이 시공한 딥하우스가 2017 한국 디자인 연감에 수록되었습니다. 월간 디자인이 매년 국내 주요 디자인 프로젝트들을 그래픽, 디지털 미디어, 아이덴터티, 프로덕트, 리빙, 공간 6개 부분으로 나누어 선정합니다. 딥하우스는 공간 부분에 포함되었습니다. Homin Kim, director of poly.m.ur, is talking in the Architectural Department of Korea National University of Arts about British architecture and London under the title of ‘Sketchbooks in London’. Above all, it is a chance to see his texts and drawings in the sketchbooks that were drawn for the first three months when he moved to London for his study in the AA school in 2000. 한국종합예술대학 건축과에서 김호민 소장님의 ‘런던에서의 스케치북’ 이란 제목으로 영국의 건축과 도시를 소개하는 강의가 있습니다. 2000년 영국에 도착했을 때 느꼈던 신선함과 생경함에 학교 시작하기 전 첫 석 달 동안 런던이란 도시를 알기 위해 열심히 돌아다니던 시절 좋아하게 됐던 건축물들을 소개하는 자리입니다. 무엇보다 17 년 만에 그 당시 그렸던 스케치북들에 담긴 글과 그림들을 공개하는 자리라고 합니다. MINI BUILDING revisited Eleven Hills by poly.m.ur. 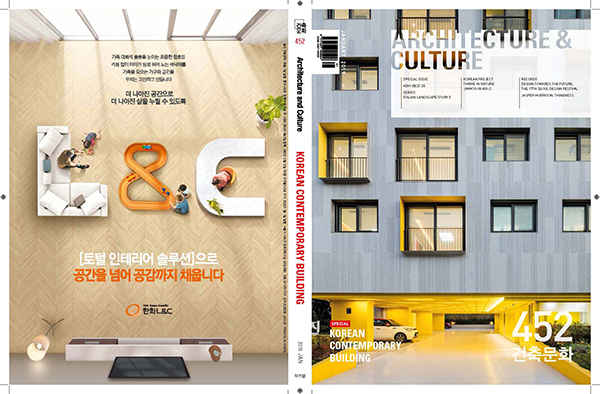 We would like to express our deep gratitude towards A&C publisher and Heungchae Jung. We also greatly appreciate Eunjae Mah for this meaningful article and Shin Kyungsub for photographs. 일레븐힐즈 프로젝트가 에이앤씨 출판사에서 발행하는 미니 빌딩 시리즈 6권에 개재되었습니다. 총 네 페이지에 걸쳐 프로젝트에 대한 자세한 설명과 함께 신경섭 작가의 멋진 사진들로 채워주신 정홍채 대표님과 기자님께 감사의 말씀을 올립니다. The ZIP-OPUS office project in Paju Book City by poly.m.ur has scooped the Gyeonggi-do’s architecture award 2017 Bronze Medal. 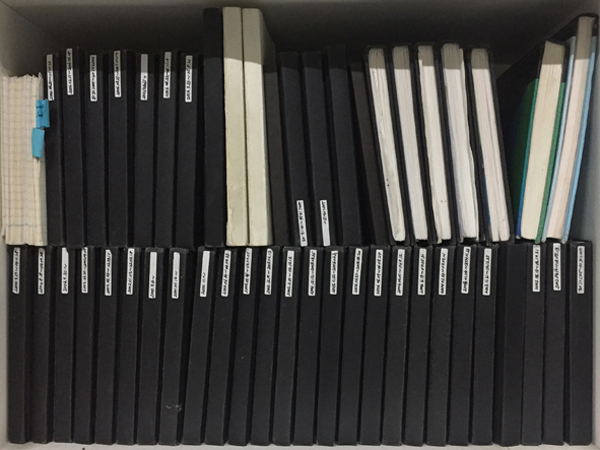 Zip Cinema is a premier film studio in Korea known for an extensive list of blockbuster titles such as Jeon Woochi :The Taoist Wizard (2009), Cold Eyes (2013), and The Priests (2015). First meeting with the client took off amicably as both parties were committed to the same goal: zip, which is the name of the studio and also means ‘house’ in Korean. However, decision by Zip Cinema, a studio that produced 10 movies in the last 10 years, to partner with a relatively new architecture firm with a decade of history may have been somewhat unexpected at first. The office has 4 upper floors and 1 basement floor with the gross floor area 2,560 square meters. It features dormitory, studio, café, publication facilities for scenario writers to support their creative works. We would like to acknowledge Hyunju Lim, team leader of the project, for her consistent dedication to the outstanding outcome, covering from initial design stage to the site supervision. We would also like to express our gratitude towards Yena Lee, a student intern, who has participated in the final digital modelling during pre-construction stage. Last but not least, we thank Jeong-Hun Han, representative director of Zip Cinema, Chung-Ho Joh, representative of OPUS pictures, Man-Gyu Jeong, chief officer of site and Seok-Jun Go and Young-Min Lee, directors of Dooyoung ltd.
파주출판문화단지의 영화사 집 프로젝트가 경기도 건축문화상 사용승인 건축물 부분에 작년에 이에 다시 한번 동상에 선정되었습니다. 전우치, 감시자들, 검은 사제들을 제작한 영화사집의 새로운 보금자리로 파주출판영상 단지 내에 위치해 있습니다. 2014년 건축주와의 첫 미팅 뒤로 거의 2년동안 설계와 감리 과정을 거쳐 완공할 수 있었습니다. 디자인과 실시 설계, 감리까지 책임졌던 임현주 팀장님, 한정헌 감독관님, 오퍼스 픽처스의 조충오 팀장님 그리고 시공사 두영 건설의 고석준, 이영민 대표님과 정만규 차장님에게도 감사의 말씀을 드립니다. 특히 폴리머의 대표이자 전통 건축에 대한 조언을 아끼지 않고 계신 김홍식 교수님께서 직접 수상하신 자리라 더욱 의의가 있었습니다. 또한 폴리머의 가족 기업으로서 현재 한 건물에 있는 금성종합건축의 김용미 대표님은 우수상을 받아 남매인 두 분이 함께 수상하는 뜻 깊은 자리가 되기도 했습니다. 폴리머 김호민 소장님의 세포적 건축이 발간되었습니다. 이 책은 지난 10년 동안 활동했던 스스로를 돌아보며 정리하고 싶었던 건축가와 한국 건축을 세계에 알리려는 출판사의 기획이 서로 잘 맞아 떨어졌다고 합니다. 서울대학교와 대우 건설에서의 근무, 그 후 런던 에이에이스쿨에서의 유학, 에프오에이에서의 실무, 코넬 대학교에서 1 년간 티칭, 귀국 후 2008 년부터 현재까지 고군분투하며 진행했던 프로젝트들을 소개하며 지금을 살아가는 건축가로서 사회적 역할과 책임에 공감하면서도 다가올 미래를 위해 새롭게 정립되어야 할 건축에 대한 가치관과 생각을 함께 실었다고 합니다. 또한, 디자인 도구로서 설계 방법론의 중요성을 건축을 요리에, 방법론을 레시피로 비유함으로써 강조했다고 합니다. 지난 1 년 동안 매일 새벽 3시에 일어나 글 쓰는 고충을 이해해준 주변 사람들, 책의 기획부터 글의 방향성, 전체적인 흐름에 대한 조언을 아끼지 않았던 공간의 박성진 편집장님, 부족한 글을 몇 번씩 수정하면서도 지치지않고 끝까지 독려해주신 공을채 기자님, 그리고 멋진 표지와 편집 디자인으로 책을 한층 더 빛나게 해 주신 최승태 선임디자이너님, 익숙치 않은 건축 관련 내용임에도 영문 번역을 위해 기꺼이 몇 배의 노력을 기울여 준 재니스 박님께 감사의 말씀을 전합니다. 또한 10 년 동안 쌓여 있던 수많은 도면과 다이어그램들을 꼼꼼히 잘 정리해준 임현주 팀장님 고생 많으셨습니다. 무엇보다 폴리머의 모든 프로젝트를 이미지로 잘 담아주고 계신 신경섭 작가님께도 감사드립니다. 그리고 많이 부족한 후배임에도 이 시리즈에 선뜻 같이 하도록 허락해주신 조병수 소장님과 김승회 교수님께 심심한 감사를 표합니다. Poly.m.ur will give a lecture under the title of ‘System vs. Recipe of architects’ as a part of lecture series ‘Saturday 11 a.m. with Architects’ run by Junglim Foundation since 2012. The theme of this season is Public Housing, and Homin Kim will give opinions about future of public housing in Korea. In 1997, his career started as a site inspector of apartment housing in Daewoo Construction company, which enabled him to understand a system comprising lots of strict rules that are mainly related to efficiency and economic reasons. Simultaneously, he also realized that it is architect’s role to develop new design recipes as alternatives to change the future. 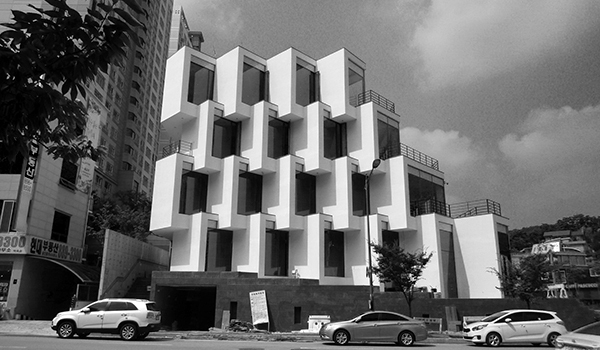 Homin Kim will present a number of projects completed for the last ten years of practice. Please join us on Saturday the 16th of September at the Arko Art Centre. 정림문화재단 주최로 열리는 ‘건축가와 함께하는 토요일 11시’ 에 폴리머 김호민 소장님이 공동주택의 시스템 vs. 건축가의 레시피 의 제목으로 강연을 합니다. 대학 졸업 후 시공 기사로 3 년간 일하며 경험했던 아파트는, 평당 공사비를 맞추기 위해 외부에서 값싼 노동력을 지속적으로 수입하고 똑 같은 평면을 끊임없이 뽑아 올려야 하는 일종의 괴물이었습니다. 100여 년 전 르 코르뷔지에가 제안했던 도미노 이론은 이렇게 대한민국에서 굳건한 시스템으로 고착되어 왔습니다. 한편 현대의 건축가들은 이에 대한 대안들을 내기 위해 끊임없이 노력해오고 있습니다. 마치 요리사가 맛있는 음식을 만들기 위해 기존의 레시피를 수정하듯 재료, 구조, 시공법, 법규 등을 고쳐 방법론을 가다듬습니다. 지난 10년동안 사무실을 운영하며 완공했던 사당동의 에스에스에이치 하우징, 나주 문화재연구소 기숙사, 삼전동 나홀로 아파트, 기예능공방, 중원문화재 연구소 기숙사 등 기존 시스템을 수정하고 고쳐 새롭게 쓴 레시피에 의한 프로젝트들을 소개합니다. 9월 16일 오전 11시, 장소는 대학로 아르코 미술관 1층입니다. 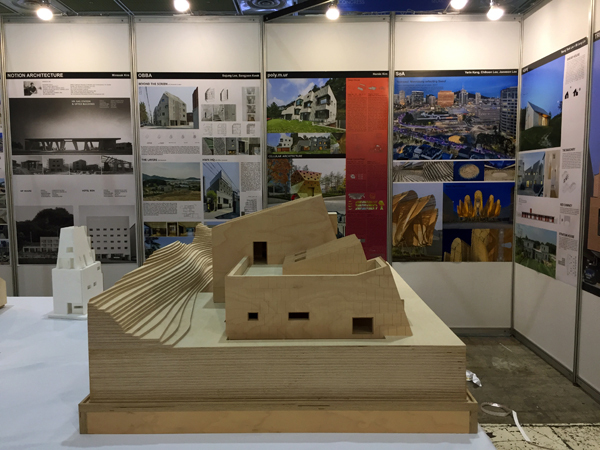 Poly.m.ur was invited to exhibit for UIA 2017 in Seoul in the work of young architects section. The exhibition will be open till the 7th of September in Exhibition Hall C, COEX Seoul in Samsung-dong. 폴리머가 UIA 2017 행사 중 젊은 건축가 전시에 참여합니다. 최근에 완공한 벽이 깊은 집 모형이 처음으로 전시될 예정이고, 며칠 내로 발간될 김호민 소장님의 ‘세포적 건축’ 도 출판사 공간에서 따로 마련한 부스에서 판매된다고 하니 많은 분들의 관심 부탁드립니다. 삼성동에 위치한 서울 코엑스에서 9월 3일부터 7일까지 개최될 예정입니다. We are very glad to announce that the House project ‘Bay-window’ has been completed. It was designed for a family with a husband and wife and their two children. As the site is located in the Gangnam area (Seocho-gu) where normally land cost a lot more, we aimed at maximizing quantity without losing spatial quality by folding the outline internally. Consequently, dual purpose of ‘space of exterior’ and ‘space of windows’ is achieved that are closely connected to fascinating life that unfolds near and around windows. We would like to acknowledge Jihye sun, team leader of the project, for her consistent dedication to the outstanding outcome, covering from initial design stage to the site supervision by visiting site three times a week. We would also like to express our gratitude towards Byungsun Park and Seongjun Park, Thekujo, structural consultants, Jinyoung Lee and Shinwoong Si, Hanil MEC, mechanical consultants, and Jaegeum Joe, electrical consultant of the project. In addition, we acknowledge passionate involvement of the contractor, Yang-gil Kim, representative of J-archive, and Daewoo Jung and Yunsoo Mok, site managers. We would also like to express our gratitude towards Yunseok Cho, representative of Zentas Korea and participants having dealt with Fiber Cement panels. 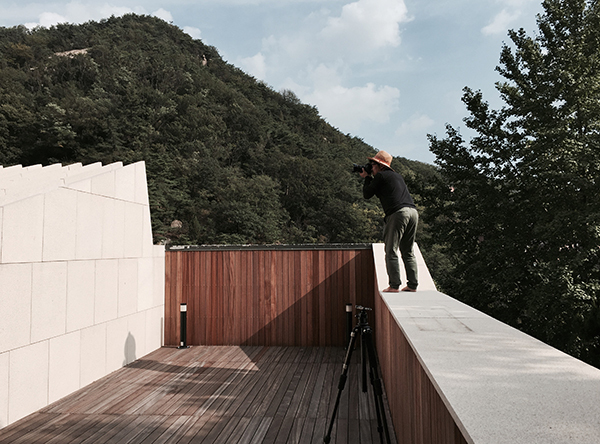 Last but not least, we thank Kyunghee Nam, client of the project and Kyungsub Shin for making every effort to take good photographs. 8 개월동안 설계와 거의 1 년 간의 시공 기간을 거쳐 주택 164346이 완공되었습니다. 높은 지가에 넓지 않은 대지 조건을 고려하여 건폐율과 용적율을 최대한 확보하면서도 변화 있는 내부 공간을 계획하고자 했습니다. 몇 날 며칠 수십장의 도면들을 그리며 설계에 매진했던 선지혜 팀장과 이재만, 김보름, 신재민씨 고생 많았습니다. 매번 어려운 구조 설계를 끝까지 책임져 주시는 터구조의 박병순 소장님, 박실장님, 기계설비 설계를 해주신 한일 엠이씨의 이진영 이사님과 시신웅 실장님, 전기 설계를 꼼꼼히 해주신 지성컨설턴트 조재금 소장님 감사합니다. 무엇보다 어려운 시공을 맡아 끝까지 마무리해주고 계신 제이아키브와 정대우, 목윤수 소장님 그리고 김양길 대표님 너무 고생 많으셨는데 하자 보수까지 마무리 잘 부탁드립니다.. 에프씨패널이라는 독특한 외장재 시공을 마무리해주신 젠타스 코리아 조윤석 실장님과 현장 담당자분들 고생 많으셨습니다. 무엇보다 시공 기간 내내 꼼꼼히 일주일에 세 번씩 현장을 찾아 감리를 맡아준 선지혜 팀장과 집 내부 부엌 및 소품들을 손수 챙겨주신 남경희 건축주께도 감사의 말씀을 드립니다. 중앙대학교 건축학과 졸업전 행사의 일환으로 폴리머 김호민 소장님의 특강이 있습니다. 지난 10 년은 세상과의 싸움이었을 뿐 아니라 스스로에 대한 도전이었습니다. 설계사무실을 하며 만났던 다양한 사람들을 통해 현대인을 이해하게 됐습니다. 그들은 무엇보다 이중적 성향을 보이는데 익명성에 숨고 보편성을 즐기지만 다양성을 중시하고 개성을 표출하는데 익숙합니다. 20세기 매스미디어 중심의 대중 사회로부터 21세기의 모바일 네트워크로 빠르게 이동했기 때문입니다. 20세기 근대주의를 주도했던 시스템이 레시피에 그 자리를 내주게 되었습니다. 지엽적이지만 보편적이고, 하나이되 여럿이며, 특수하지만 일반적인 방법론이 레시피입니다. 부분적인 해결책이면서 동시에 질서를 관장하기 위한 논리로 작동합니다. 지엽적인 요구들에 대한 대응이 전체로 확장되기도 합니다. 무엇보다 기계적인 반복에 의존하지 않는다는 점이 시스템과의 가장 큰 차이라고 할 수 있습니다. 이번 강의를 통해 건축 설계를 삼대 째 가업으로 잇고 있는 건축가 김호민이 지난 20년 동안 교육과 실무 경험을 통해 세상과 대화하고 부딪히며 만들어낸 건축 설계의 레시피들에 대한 이야기를 풀어내고자 합니다. 벽이 깊은 집이 ‘전원 속의 내집’ 220 호 건축가의 집 코너에 총 8 페이지에 걸쳐 소개되었습니다. A catalogue of innovative solutions culminates in a well-thought-out realisation. 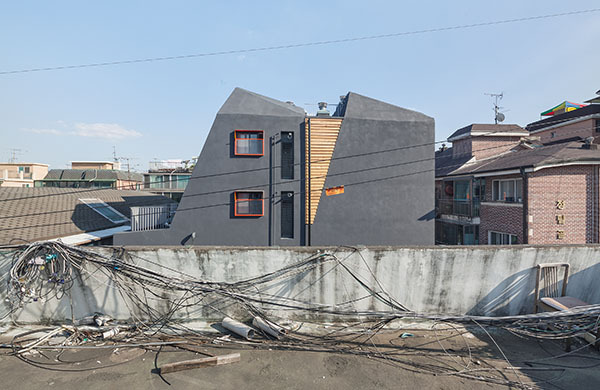 Although it took six years to complete, the project proves that reinterpreting seemingly independent elements can bring them together to create a unified resolution – something that Homin Kim hopes will provide an example for a new type of residential home in Korea. 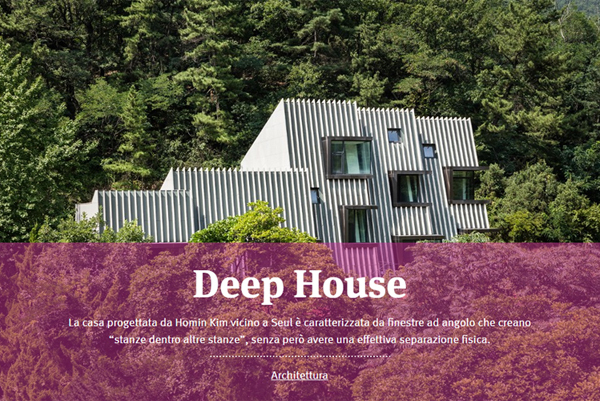 Deep House is situated at the foot of a quint trail that leads up toward Bukansan Mountain, near Seoul. The most striking feature of the house is its roof, slanted at an angle, which streamlines flawless as walls as a single unit. By opting against conventional use of the concept of roof and eaves and adopting exterior stone louvers, volume of the Deep House is dispersed in shallow depth throughout. Another noticeable feature of the Deep House is its use of corner windows. Once the layout of the rooms was confirmed, corners of the rooms were left exposed by installing box-type windows. Rooms and the size of corner windows were strategically laid out to allow maximum benefit of the spectacular scenery from inside while minimizing adverse impact of chilly winter draft. Corner windows are ‘window space’ but also creates ‘rooms inside rooms’, not separated by any physical boundary of walls. The room may appear as one space, but you can clearly perceive that an independent space exists there. 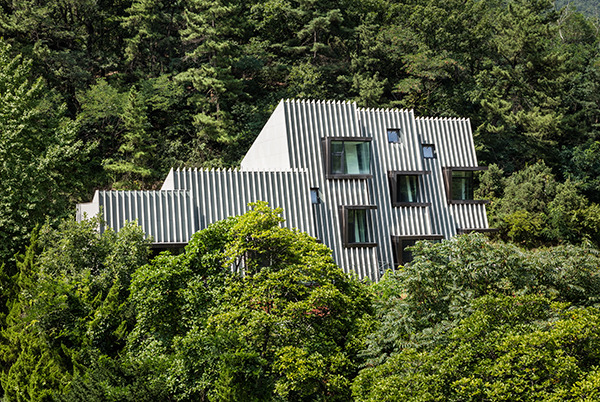 Limestone louvres and boxy windows cover the angled walls of this home outside Seoul, which was designed by local studio Poly.m.ur to house three generations of the same family. “The most striking feature of the Deep House is its roof, slanted at an angle, which streamlines flawlessly with the walls as a single unit,” said the architects. “By opting against conventional use of the concept of roof and eaves, and adopting exterior stone louvers, the volume of the Deep House is dispersed in shallow depth throughout,” they continued. The volumes progressively stagger forward to open up side views from large corner windows, which the architects worked into the design after spotting the same feature in the client’s previous house. Some of the openings are indented in the facade and others project outwards, creating nooks inside for the residents to enjoy the afternoon tea or relax with a book. “Rooms and the size of corner windows were strategically laid out to allow maximum benefit of the spectacular scenery from inside, while minimising adverse impact of chilly winter draft,” the architects explained. 에스에스에이치 하우징이 제 8 회 서울건축문화제의 일환으로 발간된 매년 발간되는 서울시 건축상 도록에 함께 실려 출판되었습니다. The homecoming exhibition of the Korean Pavilion of Venice Biennale 2016 has been held in Arko Art Centre in Seoul. Under the title ‘THE FAR GAME: Constraints Sparking Creativity’, SSHousing is exhibited with other 36 projects till the 7th of May. Comparing architectural design process to a battle or game between controller (government), consumer and supplier (architect), they explain that SSHousing is a good example interpreting strict Korean regulations into a creative solution such as floor area ratio, building coverage ratio, north-south orientation setback and diagonal plane control, street width diagonal plane control, minimum distances from site boundary, number of parking spots in relation to floor area and attic with a height of less than 1.5m. They also added the most successful feature is the courtyard for residents living in 30 single units to gather and communicate without affecting building coverage ratio. 2016년 베니스 비엔날레 한국관 귀국전 오프닝이 대학로 아르코 미술관에서 있었습니다. 5월 7일까지 ‘용적율 게임: 창의성을 촉발하는 제약’ 의 주제 하에 사당동 에스에스에이치 공동주택이 다른 36 개의 프로젝트들과 함께 전시되고 있습니다. 작은 땅이었지만 건폐율, 용적율, 건축물 이격 거리, 채광창으로부터의 거리, 다세대/연립주택, 주차대수, 세대 수, 도로사선제한, 일조권사선제한, 지표면의 평균 높이 산정 등 대지에 적용할 수 있는 거의 모든 법규들을 고려해야 했던 프로젝트입니다. 대지의 경사지 조건을 이용하여 건폐율을 지키면서도 주차장 상부를 덮어 혼자 사는 30 세대의 주민들을 위한 중정 공간을 제안했다는데 의미가 있습니다. 한국공예디자인 문화진흥원에서 발간하는 공공디자인 2017년 1호에 부산소년원 학생들을 위한 운동장의 구령대 ‘바람이 머물다 간 풍경’ 이 소개되었습니다. 2016년 한국공공디자인 대상의 우수상으로 선정되기도 했습니다. 대상지는 장기소년원 송치 10호 처분을 받은 19세 미만 아이들이 직업능력 개발훈련을 통해 교정교육을 받기 위한 곳입니다. 대부분 문화적인 혜택을 충분히 받지 못한 아이들로 좀더 많은 기회를 돌려주자는 취지로 학생들에게 유일한 외부활동인 체육활동을 지원하고자 소통의 과정을 거쳐 디자인된 구령대로 소개되었습니다. Poly.m.ur wishes you a very happy 2017! Poly.m.ur has been awarded the Public Design Award 2016. 2016 대한민국 공공디자인 대상 시상식이 서울역 RTO에서 있었습니다. 폴리머가 아티스트 김병호 작가, 무빙모먼츠 이주현 대표와 공동으로 참여한 ‘행복한 구령대’ 가 우수상을 수상했습니다. 문화체육부가 예산을 지원하고 법무청 소속의 부산 오륜 정보 학교가 부지를 제공하는 프로젝트로 문화적으로 소외된 계층을 대상으로 공공에서 시설뿐만 아니라 내용까지 지원함으로써 일방향성을 지양하고 상호교류를 중요시했다는 데 의의가 있습니다. 최종 이용자인 학생들과의 인터뷰와 워크샵, 공동 작업을 통해 대상지 선정과 디자인, 최종 행사까지 함께 했다는 데 큰 의의가 있습니다. 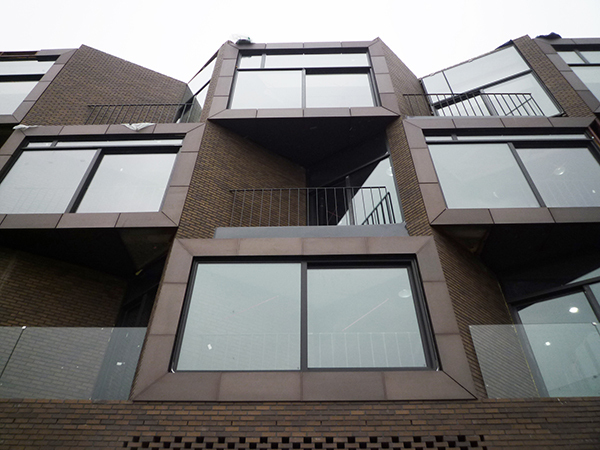 After almost two years’ work, we are very delighted to see Hannam project finally completed. This small commercial building consists of 6 upper storeys and 1 basement floor, of which the main programmes include gallery, office, restaurant, etc. Located in Hannam area, it is expected to create synergy with our new engagement. We would like to acknowledge Jaeman Lee, team leader of the project, for his consistent dedication to the outstanding outcome, covering from initial design stage to the site supervision. We would also like to express our gratitude towards Byungsun Park and Hyungcheol Bang, Thekujo, structural consultants, Kyung-kuk Kim, supervisor on site, Changjung Kim, representative of Han-gyul ltd., STO specialist and Sang-gyun Lee, directore of Yeollin curtain wall ltd. Last but not least, we thank Hyunguk Cho, representative of IAN R&C and Seon-ik Chang, representative director of IAN R&C. 작년 9월에 착공했던 한남동 프로젝트가 완공되었습니다. 지하 1층의 갤러리와 지상 총 6층에 사무실 및 레스토랑이 입점할 예정으로 한남동에 활력을 불어넣을 예정입니다. 무엇보다 프로젝트의 처음과 끝을 마무리 잘 해준 이재만 팀장에게 감사의 말씀을 전합니다. 쉽지 않은 구조 설계를 선뜻 맡아주신 터구조의 박병순 소장님, 철저하게 감리 업무를 수행해주신 금성설계의 김경국 이사님, 외단열 시공 업체인 한결 건축 김창중 대표님, 열린 창호 이상균 사장님께 감사의 말씀을 드립니다. 무엇보다 어려운 여건에서도 끝가지 노력해주신 노력해주신 이안 알앤씨의 조현국 대리님, 장선익 이사님께 감사드립니다. Project section has been updated. Two new projects (Happy series 085 Happy Canopy, 086 Happy Wolgok) are on our website. 프로젝트 섹션이 업데이트 되었습니다. 프로젝트 (085 행복한 구령대, 086 찾아가는 동주민센터-월곡1동) 가 더해졌습니다. 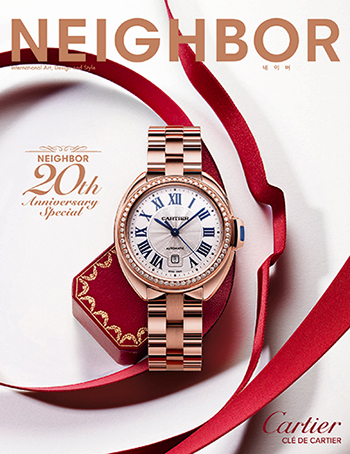 Interview of poly.m.ur is featured in the 20th anniversary issue of NEIGHBOR. Under the title of ‘Poly.m.ur’, the article explains poly.m.ur’s recent works. It freely dealt with very broad range of issues including poly.m.ur’s approach to work, exhibitions, general interests, plans of their future, lives and so on. 패션전문지 네이버에서 ‘개성과 감성을 담은 집’ 이라는 제목으로 4 페이지에 걸쳐 구기동 주택을 다루었습니다. 건축 잡지에서 다루기 힘들었던 집을 설계하는 동안 있었던 에피소드들과 건축가의 관심들 그리고 일반인의 관점에서 집에 대한 소소한 얘기들이 실려있습니다. 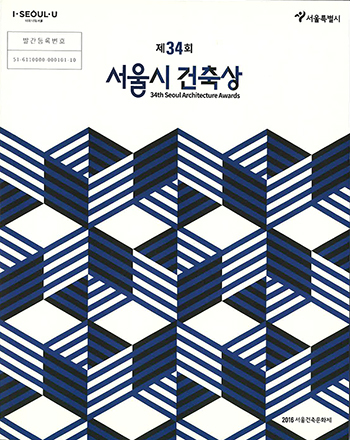 Poly.m.ur has been awarded the 34th Seoul Architecture Award. We would like to acknowledge Hyunju Lim, team leader of the project, for her consistent dedication to the outstanding outcome, covering from initial design stage to the site supervision. We would also like to express our deep gratitude towards Yangsu Bae, representative director of Seoul Housing Corporation, Chanwon Park and Daesung Kim from design stage till the construction stage. Last but not least, we thank Byungsun Park and Seongjun Park, structural consultants, Sunman Kwon, Quantity surveyor, and jury members who have chosen SSHousing from the prize. SH 공사와 함께 했던 에스에스에이치 하우징 프로젝트가 제 34회 서울시 건축상에서 우수상을 받았습니다. 어려운 환경에서 꿋꿋이 이 프로젝트를 끝까지 수행해준 임현주 팀장에게 감사의 말씀과 더불어 축하를 전합니다. 설계부터 시공까지 현장에서 직접 도와주신 서울주택공사의 배양수 차장님, 박찬원 감독관님과 김대성 대리님께도 감사를 드립니다. 폴리머의 항상 어려운 구조 설계를 도맡아 주시는 터구조의 박병순 소장님과 박성준 실장님 고생하셨습니다. 변경이 많은 일을 선뜻 맡아주신 정일 견적의 권순만 소장님 수고 많으셨습니다. 심사에 참여해서 선정해주신 심사위원들께도 감사의 말씀 드립니다. 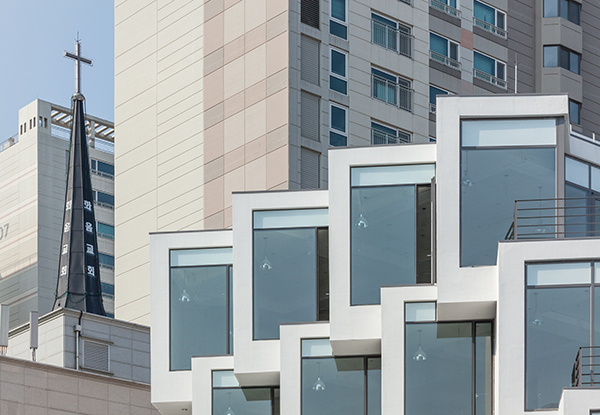 Eleven Hills in the Seong-bok dong by poly.m.ur has scooped the Gyeonggi-do’s architecture award 2016 Bronze Medal. It was such a great collaboration between old friends now as client and architect who again met to work and learn from each other. It is meaningful to poly.m.ur as the first retail project to continue on keeping interests in little commercial buildings. Last but not least, we are very pleased to hear that the Il Bianco, Italian restaurant of the Eleven Hills, is still very popular to local community of Suji area, typical outskirts of Seoul. 일레븐 힐즈 프로젝트가 경기도 건축문화상 사용승인 건축물 부분에 총 2 차례의 심사를 거쳐 동상에 선정되었습니다. 철 없던 시절에 친했던 친구를 오랜만에 다시 만나 이젠 일을 같이 하면서 많이 배울 수 있었던 프로젝트였습니다. 상업 공간에 대한 흥미를 지속적으로 갖게 된 계기가 되기도 했습니다. 일반인에게 일 비앙코란 이름의 레스토랑으로 개방한 지 벌써 2 년이 되어가지만 주변 동네 주민들의 열화와 같은 성원에 힘입어 여전히 사랑 받는 공간인 것에 만족합니다. After 5 years of work, we are delighted to announce that Deep House project is finally completed. It has been a pleasure and a pain to get it this far, and we are delighted to release the project from under our wings and let it take its first steps on its own. Above all the eventual process, we would like to express our deep gratitude towards clients who also never expected it would be delayed this far as well as Jong-gyu Kim and Yong Heo, directors of EAN R&C for their consistent dedication to the outstanding outcome. In addition, we would like to acknowledge Byungsun Park and Seongjun Park, structural consultants and Jaeguem Joe, electrical consultant of the project. We would also like to express our gratitude towards Sunki Whang, team leader of the project covering from initial design stage to the site supervision. Last but not least, we thank Hyunju Lim and Jaeman Lee from poly.m.ur and Kyungsub Shin for making every effort to take good photographs. 2011년 초에 설계를 시작한 지 5년 반이 지난 올 여름 구기동 딥 하우스의 사용승인을 득했습니다. 우여곡절이 많은 프로젝트였고 이를 통해 건축가로 성장하는데 큰 밑거름이 되기도 했습니다. 너무 많은 분들께서 도와주셔서 일일이 거론하기 힘들 정도지만 무엇보다 끝까지 믿고 인내해주신 건축주께 감사드립니다. 포기하지 않고 시공을 마무리해주신 이안 건설의 김종규 대표님과 허용 사장님 그리고 김재혁 과장님께도 감사의 말씀을 드립니다. 또한 수많은 변경들을 감내해주신 터구조의 박병순 소장님과 박성준 실장님 그리고 지성설계의 조재금 소장님께도 감사합니다. 무엇보다 폴리머에서 설계와 감리를 맡았던 황선기 팀장 고생 많았습니다. 이재만 팀장과 끝 마무리를 꼼꼼하게 챙겨준 임현주 팀장도 수고했습니다. 저희 작업을 항상 멋있게 마무리해주시는 신경섭 작가님 항상 감사합니다. The Construction of residence project 164346 located in Seocho-dong in Seoul has commenced after half a year’s design work by poly.m.ur. J-Archive, contractor well-known for many residential projects in Pangyo area, has been appointed to complete the project. This small residential building consists of 2 upper storeys and 1 basement floor with 330m2 of building area. The main programme includes basement parking space, family lounge, studio, sports facilities, living room, kitchen, and deck space with garden. In the upper floor there are a master bed and two bedrooms for children with dressroom. It features bay windows which provide pocket spaces for diverse activities as well as bring fresh air and light into the house through corner windows. 폴리머가 작년 11월부터 설계했던 서초동 주택 프로젝트 164346이 착공되었습니다. 판교에서 주택을 많이 지어 명성을 쌓은 시공사 제이아키브가 맡아주셨습니다. 총 면적이 99평으로 지하에 주차장, 운동실 및 가족실, 1층에 정원과 직접 연결되는 데크와 거실 외에, 부엌, 식당 및 다용도실이 있고 별도의 욕실을 갖춘 침실이 있습니다. 2층에 두 자녀를 위한 침실과 메인 침실, 화장실 두 개가 있으며 드레스룸이 갖춰져 있습니다. 윈도우 베이식 창문을 도입하여 창이 단순히 빛과 공기를 받아들이는 역할 외에도 많은 활동들이 일어날 수 있는 장소로서 작동할 수 있도록 계획하였습니다. 파사드의 공간의 주제에 대해 깊이 있는 연구의 결과로 기대되는 프로젝트입니다. After almost one year’s design period and countless man-hours of design and planning process, poly.m.ur, IAN R&C (contractor), and clients were all delighted to celebrate the topping out of the Hannam project with a large group of assembled subcontractors. We have only two months left to complete the building, ready for opening before summer this year. 한남동 프로젝트의 상량식이 있었습니다. 어려운 일을 맡아주신 이안 건설의 김종규 사장님, 허용 대표님 그리고 지난 8달 동안 현장을 철저히 감독하고 계신 장선익 이사님과 조현국 대리님께 감사의 말씀을 드립니다. 감리 업무에 매진해준 이재만 팀장, 금성 건축의 김경국 이사님 고생 많으셨습니다. 앞으로 두 달 동안 외부와 내부 마감 공사를 거쳐 7월 말 준공 예정으로 사무실과 레스토랑, 카페, 문화시설 등이 들어설 계획입니다. During almost half of the year, we have been endeavouring at the research project of the future housing. In the near future, there will be extremely different ways of living such as solitary life or short-term family. For the last decade, the idea of family changed dramatically so as that more people tend to live on their own. By contrast, as life expectancy gets longer, without enough social support the old have to confront the problem of survival much more than before. This new social phenomenon led to lots of problems, of which housing issue amounts to such a burden to younger generations of the future. Taking this into account more seriously, we perceived housing as a main theme of contemporary architecture. We would also like to express our gratitude towards Suhee Yum and Borum Kim who spent long hours almost every night. Last but not least, we thank those who all participated in this research project. 거의 반년 동안 매진했던 미래주택 연구용역을 마감했습니다. 미래의 대한민국은 지금과는 아주 많이 다른 삶의 양식들이 존재할 것입니다. 대부분 혼자 생활을 하거나 가족을 이루어 사는 것도 일시적일 수 있습니다. 평균 수명이 급속히 늘어나면서 사회 구성원도 변할 것입니다. 이런 사회를 맞이했을 때 우리 주거는 어떤 모습일까? 이와 같은 주제로 지난 반년 동안 아주 즐겁게 연구를 진행했습니다. 함께 밤을 새며 열심히 함께 해준 염수희 팀장과 김보름 사원 감사합니다. 이렇게 재미있게 일할 기회를 주시고 함께 연구에 동참해주신 모든 분들께도 감사의 말씀 드립니다. The construction of poly.m.ur’s office project in Hannam-dong is progressing at pace. This small commercial building consists of 6 upper storeys and 1 basement floor with total height of 20m and 970m2 of building area. The main programmes include office, café, restaurant, etc. Located in one of the trendy areas of Seoul and surrounded by brand new cultural facilities such as D Museum, Second Kitchen and many others, it is expected to create synergy with our new engagement. 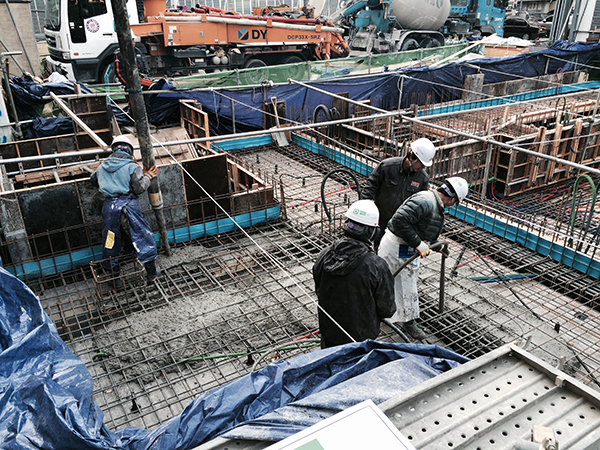 Currently, concrete works of the ground floor is under construction. 폴리머의 한남동 오피스 프로젝트가 신축 중에 있습니다. 970m2 규모로 지하 1층, 지상 6층로 카페, 레스토랑, 사무실 등으로 채워질 소규모 상업 건축입니다. 주변에 대림 미술관, 세컨 키친 등 카페와 문화 시설들이 밀집해 있는 지역으로 시너지가 있을 것으로 기대되는 지역입니다. 현재 지상 1층 골조 공사 중에 있습니다. 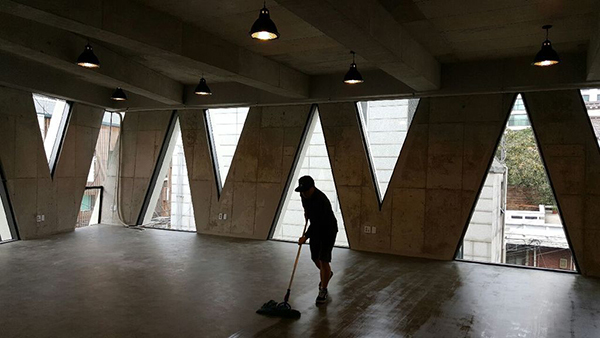 The ZIP-OPUS office project in Paju Book City, as scheduled to be completed in January, is near its completion. The office has 4 upper floors and 1 basement floor with the gross floor area 2,560 square meters. It features dormitory, studio, café, publication facilities for scenario writers to support their creative works. We would like to acknowledge Hyunju Lim, team leader of the project, for her consistent dedication to the outstanding outcome, covering from initial design stage to the site supervision. We would also like to express our gratitude towards Yena Lee, a student intern, who has participated in the final digital modelling during pre-construction stage. Last but not least, we thank Jeong-Hun Han, representative director of Zip Cinema, Chung-Ho Joh, representative of OPUS pictures, Man-Gyu Jeong, chief officer of site and Seok-Jun Go and Young-Min Lee, directors of Dooyoung ltd.
파주 영화사집-오퍼스 사옥이 현재 내부의 마감 공사를 마무리하는 중으로 막바지에 이르렀습니다. 지하1층, 지상4층, 약 800평 규모로 신축된 영화사집-오퍼스 사옥은 향후 영화 작가들의 기숙사 겸 작업실, 사무실, 카페, 출판 업무 등을 담당할 예정으로 1월 중 준공 예정입니다. 그 동안 설계와 감리 업무에 최선을 다해준 임현주씨, 실시 설계 단계에서 최종 모델링에 참여했던 이예나 학생, 영화사집의 한정헌 감독관님, 오퍼스 픽처스의 조충오 팀장님 그리고 시공사 두영 건설과 고석준, 이영민 대표님과 정만규 차장님에게도 감사의 말씀을 드립니다. 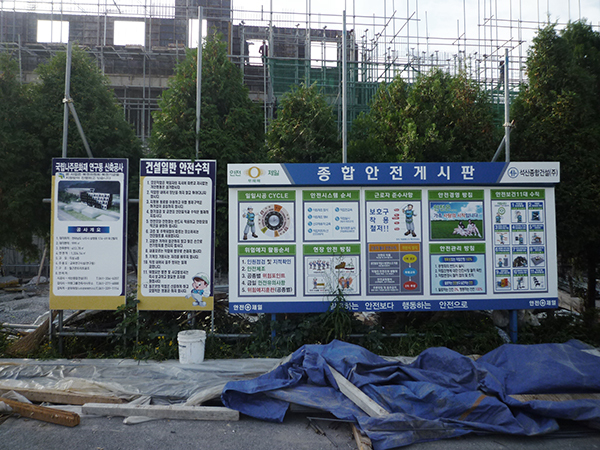 The dormitory for Naju National Research Institute of Cultural Heritage is progressing fast towards its completion. First parts of paving works and landscape started to take shape outside while interior works are ongoing on a steady pace. The construction began only when the budget was secured in 2015 since the completion of design stage in 2013. Another major delay was caused by unexpected site conditions which required additional piling works and the increase of cost as a result. Due to the Korean regulation that design and supervision should be carried out by separate architects, issues of responsibility came about when modifications to the design were compulsory. Above all the eventual process, we would like to express our gratitude towards all our staff – Seungjun Oh, Gaeyoung Jang, Narae Lee (student intern), Jaeho Song (team leader of poly.m.ur). 나주국립출토 유물센터의 기숙사가 최종 마무리 단계에 이르렀습니다. 외부 조경과 토목 공사를 진행 중이고 내부도 마감 공사도 한참 진행 중입니다. 2013년에 시작해서 예산이 확보되지 않아 2015년에 공사가 시작되면서 계획에 없던 지반을 올리고 파일 공사를 추가하는 과정을 밟았습니다. 설계와 감리가 분리되면서 현장에서 유기적으로 해결되던 문제들이 책임 소재가 불분명해지면서 누군가 희생을 하지 않고서는 발주처, 설계사에게 어려운 시행착오를 또 겪었습니다. 설계 단계에서 수고해준 오승준, 장계영씨와 실시 설계 단계에 참여했던 이나래 학생, 그리고 이 프로젝트를 묵묵히 수행해준 송재호 팀장에게 감사의 마음을 전합니다. 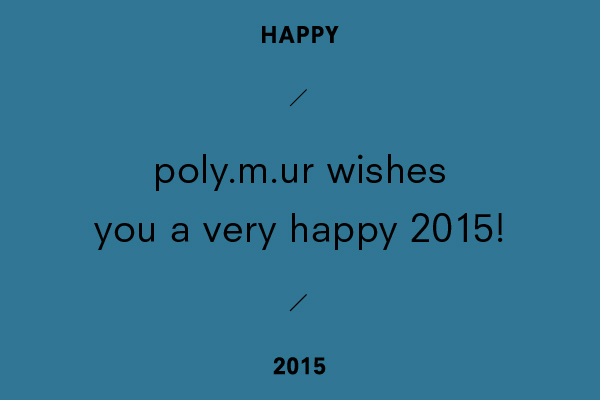 Poly.m.ur wishes you a very happy 2016! Spaces (interior and exterior) are formed and defined by facades, by elements often described as walls, floors and ceilings. These elements create separation and subdivision, creating interior spaces separated from exterior, private spaces separate from public, light & warm spaces separate from dark & cold. Using a number of recent projects, we will illustrate a number of differing approaches can be explored to question the simplicity and quality of these defining surfaces. Please join us on the 17th of November at 2:00 pm at Jeju Culture and Art Foundation, Donggwang-ro 69, Jeju. 제주건축문화제의 개막식 행사로서 ‘파사드의 공간’ 이란 주제로 폴리머 김호민 소장님이 초청 강연을 합니다. 근대 이후로 공간은 벽, 바닥, 천정 등 마치 기계처럼 분해된 건축의 요소들에 의해 규정되어 왔습니다. 이로 인해 결국 외부와 내부, 공공의 영역과 사적인 영역, 바깥 환경과 내부 공간처럼 종합이나 통합보다는 구분과 분리가 강조될 수 밖에 없었습니다. 지난 8 년의 건축적 실험은 이에 대한 문제의식을 기반으로 이루어져 왔으며 파사드를 단순한 표피로부터 공간을 포함한 외피로 확장하기 위한 과정이었습니다. 강의는 다수의 프로젝트들을 사례로 위 주제를 다루게 됩니다. 11월 17일 오후 2시에 제주문예회관에서 있습니다. 주소는 제주시 동광로 69번지입니다. 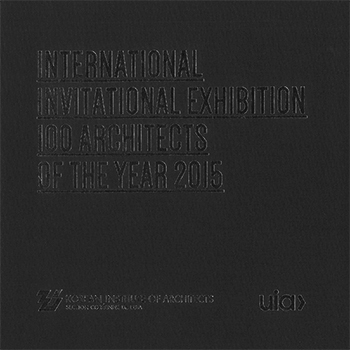 Poly.m.ur was invited to exhibit for the International Invitational Exhibition 100 Architects of the Year 2015 in Seoul. 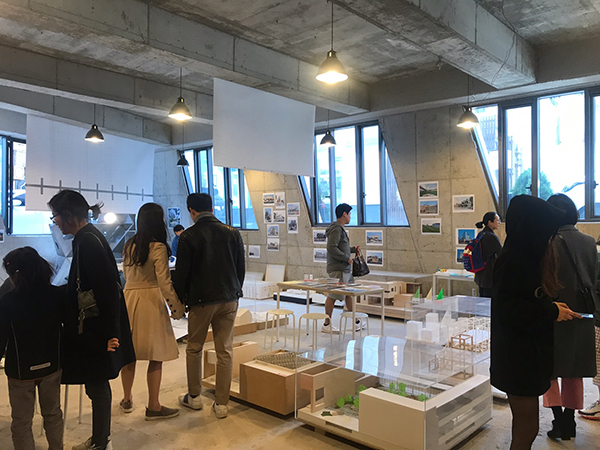 The exhibition, approved as an international exhibition by UIA, has been organized by the Korean Institute of Architects. We greatly appreciate all the supports those who passionately devoted themselves to this exhibition, including Ngoc Ahn Luu, intern from Mount Holyoke College, Hongsu Kim and Wonhee Kim from Kangwon National University and Elia Ten from Seoul National University. 폴리머가 건축가협회가 주관하고 UIA가 인증한 2015년 건축가 100인전에 초대되어 서울역 284에서 10월 25일까지 전시 중입니다. 여름 내내 모형 만드느라 고생한 Ngoc Anh Luu, 지금은 군대에 있는 김홍수씨 그리고 김원희, Elia Ten 씨 고생 많았습니다. Poly.m.ur participated in the project ‘Creating Happy Place with Culture’ initiated by Ministry of Culture, Sports and Tourism and commissioned by Korea Craft and Design Foundation to promote and provide cultural benefits to social groups that are often marginalized. 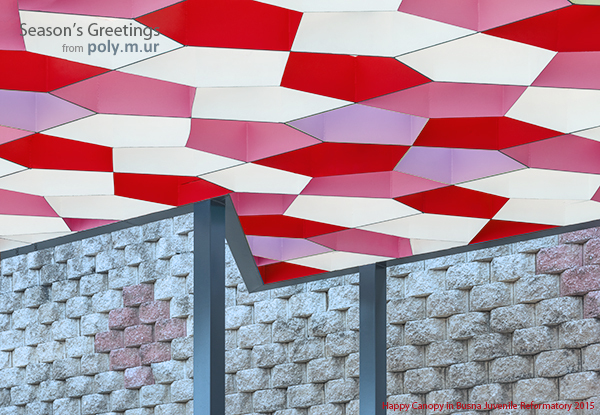 Poly.m.ur, in collaboration with Byungho Kim (artist) and Juhyun Lee, successfully constructed ‘Happy Canopy’ at a juvenile reformatory and three military base camps, has been thoroughly featured in ‘Making Space’, the book commissioned by Korea Craft and Design Foundation to mark its completion. 2014년 김병호 작가, 이주연 대표와 함께 진행했던 부산 소년원의 해피 캐노피 프로젝트가 ‘문화를 짓다’ 라는 제목의 책으로 발간되었습니다. 문화체육관광부에서 주최하고 한국공예디자인진흥원에서 주관 하에 문화의 혜택을 많이 누리지 못한 소외 지역에 문화를 좀더 누릴 수 있게 하자는 취지에서 시작되었습니다. 부산 소년원을 비롯해 군부대와 소년원을 합해 총 12곳의 대상지를 선정해 진행되었고 그 결과물들인 총 12곳의 사례들을 모아 책으로 발간되었습니다. 많은 디자인 변경과 시공 문제로 일년 내내 묵묵히 고생한 이재만 팀장 고생 많았습니다. 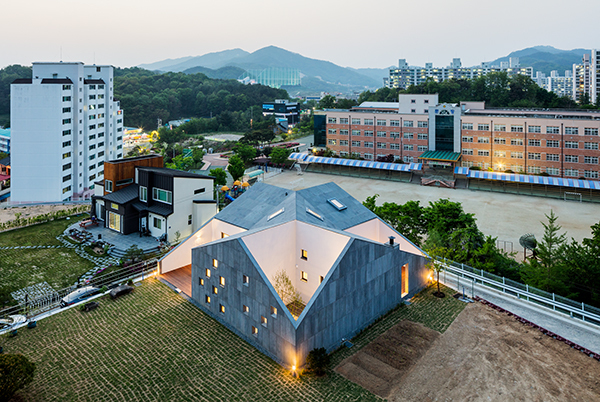 Wolgok-1 dong Community Centre by poly.m.ur and the other 64 community projects contributed a part at the exhibition during Seoul Architecture Festival 2015 under the curatorship of Jeong-eun Kang, director of Every Architects. The exhibition is from the 8th of October to the 8th of November 2015. 10월 8일부터 11월 8일까지 국세청 남대문 별관으로 쓰이던 자리에서 개최되고 있는 2015년 서울건축문화제 일환으로 ‘더불어 사는 세상-찾아가는 동주민센터’ 에 월곡1동 주민센터를 전시하고 있습니다. 총 74개 중 64개의 프로젝트가 전시 중으로 에브리 아키텍트의 강정은 소장께서 큐레이터로 고생해주셨습니다. In spite of limited budget, time and low construction quality, the project fortunately came out of a great success thanks to Jaeho Song, team leader of the project, who devoted himself to assure the quality of the outcome. We would like to show our appreciation to his efforts. Simple design intervention and clear office layout was much in need a the previous centre which could not function efficiently as it was crammed with advertisement flyers. 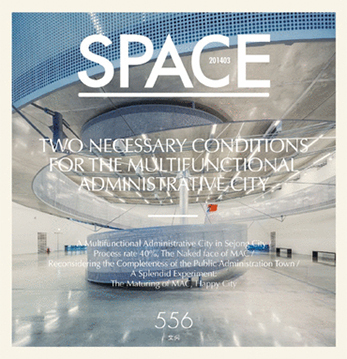 Space magazine also described “it does not look like it has changed a lot, but it now provides sufficient space for the users and it does feel different due to its new simple design. 건축 전문지 공간에서 올 상반기에 서울시 공공건축가들이 참여했던 동주민센터 프로젝트를 기획하며 폴리머의 월곡 1동 사무소를 다루었습니다. 기간과 비용, 시공 등 여러 면에서 쉽지 않은 일이었지만 공공건축가로서의 사명감과 송재호 팀장의 노력으로 다행히 좋은 결과물이 나올 수 있었습니다. 기존의 비좁고 홍보물로 가득하던 주민센터를 효율적인 공간배치와 간단한 디자인을 활용해서 많은 공간을 할애하고자 했던 점이 주목을 받았다고 생각합니다. 공간지에서도 “겉으로 봐서는 크게 바뀐 게 없지만, 민원공간을 대폭 넓히고 간단한 디자인으로 이전과 많이 달라진 효과를 냈다.”라고 언급했습니다. A new dormitory for Naju National Research Institute of Cultural Heritage is on steady progress to meet the opening date early next year. Despite two months’ delay caused by unexpected site conditions, the project team do their best to complete on time. The concrete frame has reached the first floor and the completion of the entire structure is due October. The four-story building around 1,135 square meter wide and 13.5 meter high includes multi-functional space on the ground floor and 15 dormitory units on the upper 3 floor. Two of which are two bedroom guest rooms for families and the rest are shared by two researchers. 고된 발굴과 밤샘 보고서 작업이 많은 연구원들의 복지 향상을 위해 신축 중인 나주출토유물보관센터의 게스트 하우스 프로젝트가 내년 초 완공을 목표로 진행 중입니다. 현장 상황으로 인해 몇 가지 변경들이 발생하면서 애초 일정에서 두 달 정도 늦어지고 있지만 최선을 다해 마칠 계획입니다. 현재 지상 2층 골조 공사를 마친 상태이고, 10월까지 전체 뼈대가 완성될 예정입니다. 총 연면적 1,135m2, 최고 높이 13.5미터, 4층 규모로 다목적 전시가 가능한 1층의 문화 공간을 제외한 2층에서 4층까지 총 15개의 숙소들로 구성됩니다. 두 연구원이 함께 쓸 수 있는 20 평형대 13세대와 가족이 함께 기거 가능한 40 평형대 게스트 룸 2세대로 구성됩니다. 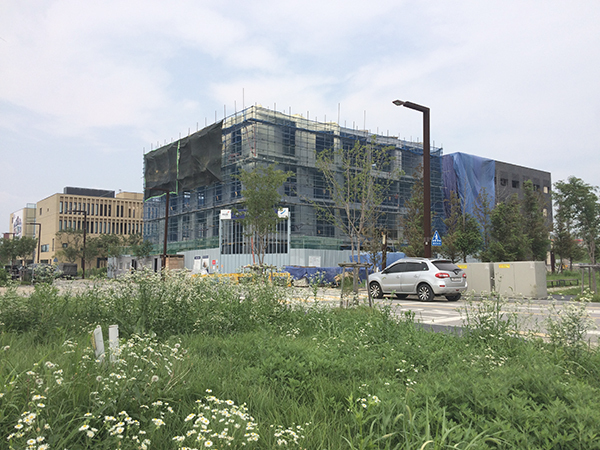 The construction of poly.m.ur’s second office project in Paju Book City is progressing at pace. The project was commissioned by ZIP cinema and OPUS pictures last year and its completion is due November 2015. The former is renowned for its work on Cold Eyes (2013), Jeon Woochi: The Taoist Wizard (2009), and All About my Wife and the latter for The Man from Nowhere (2010). The brick building consists of 4 upper storeys and 1 basement floor with total height of 15m and building area 2,560m2. The main program of the building includes office, café, indoor water features, event hall, scenario room, etc. A space for constant innovation, ZIP Cinema and OPUS Pictures office features ubiquitous balconies acting as pockets of individual space for creation and active interactions in a vibrant working environment. 파주에 영화사집-오퍼스 사옥을 신축 중에 있습니다. 영화사집은 감시자들, 내 인생의 모든 것, 전우치 등을 개봉했고 오퍼스는 영화 아저씨로 유명해진 곳입니다. 2014년 반 년 간의 설계 기간을 거쳐 올 3 월에 착공하였고 11월 준공 예정입니다. 내부는 오피스와 카페, 이벤트 홀, 수공간, 시나리오 창작실 등으로 구성되어 있으며 최종 외장재는 벽돌입니다. 각 층마다 발코니를 만들어 업무 공간의 효율을 높이고 창의 공간으로서의 특성을 나타내고자 했습니다. 높이 15미터, 4층, 지하 1층, 총 연면적 2,560m2 규모로 파주에 지어지는 두 번째 폴리머 작업입니다. 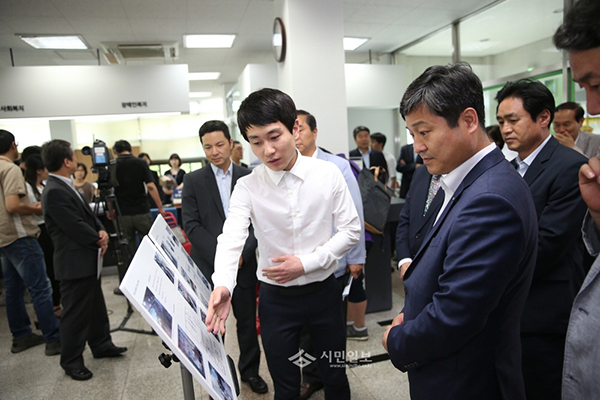 Park Wonsun, Mayor of Seoul, paid a visit to Wolgok 1(il)-dong Community Centre as it was celebrated as a fine example of thoughtful design achieved within the tight budget. 서울시에서 진행했던 찾아가는 동주민센터 프로젝트의 일환으로 진행했던 월곡1동 주민센터 프로젝트가 예산에 맞춘 모범 사례로 추천되어 박원순 시장님께서 방문했습니다. 김호민 소장님과 송재호 팀장님의 브리핑 후에 새롭게 단장된 공간을 돌아보시고 주민들과 직원들의 의견을 수렴했습니다. 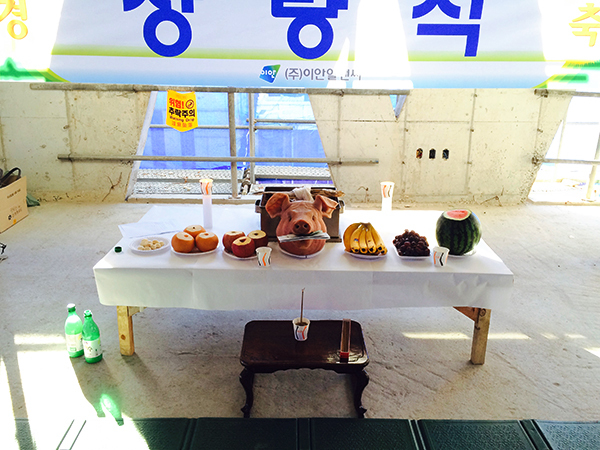 Kim Young-bae, Ward Mayor of Seongbuk-gu, hosted the opening ceremony of Wolgok 1(il)-dong Community Centre recently completed by poly.m.ur. The aim of this project was to provide better public welfare services for citizens through renovation works of interior spaces. We, as one of 67 teams of architects, designed the hall and office and mainly focused on the methods of keeping balance between quality and budget, function and ornament, design and performance throughout the project. We greatly appreciate Song Jae-ho, team leader of poly.m.ur and Lim Hun, contractor of project. Also we would like to express our deep gratitude towards Choi Jong-sam, representative of Sungbuk-gu Government Division, Shin Soo-ryun, chief officer of Wolgok 1(il)-dong and Lee Myung-joo, representative of Wolgok 1(il)-dong. 서울시에서 진행했던 찾아가는 동주민센터 프로젝트의 일환으로 진행했던 월곡1동 주민센터 프로젝트가 성북구의 좋은 사례로 선정되어 개청식에 김영배 구청장께서 참여했습니다. 보편적 복지를 실현하자는 의도 하에 서울시의 67개 동들이 동참하였고 이 취지에 공감한 다른 67분의 공공건축가분들과 함께 수행하게 되었습니다. 이 프로젝트는 새로 추가되는 복지 서비스의 기능을 위한 공간을 창출할 뿐 아니라 주민센터의 활용도를 높이기 위한 목적으로 시작되었습니다. 또한 최대한 많은 공간을 주민들에게 할애하되 동사무소 직원들의 업무 효율도 최우선적으로 고려하자는 취지에 어느 정도 공감대가 형성된 거 같습니다. 지난 두 달 동안 설계하느라 고생했던 송재호 팀장과 시공을 기꺼이 맡아주신 빌든쿠마의 임훈 사장님 수고 많으셨습니다. 프로젝트를 처음부터 챙겨주신 성북구청의 최종삼 주임님, 무엇보다 주민공청회를 세 차례나 주최하시고 꼼꼼하게 챙겨주신 신수련 동장님, 담당자이신 이명주 주임님께도 감사의 말씀을 전합니다. Project section has been updated. Five new projects (059 Deep House, 070 Eleven Hills, 076 SSHousing, 080 Heemang, 081 Kiosk) are on our website and 057 JW Marriott hotel and 049 JW research centre are updated. 프로젝트 섹션이 업데이트 되었습니다. 프로젝트 (059 딥하우스, 070 일레븐힐즈, 076 에스에이치하우징, 080 희망, 081 키오스크) 가 더해졌습니다. 057 제이더블유 메리어트 호텔과 049 제이더블유 연구 센터도 업데이트 되었습니다. 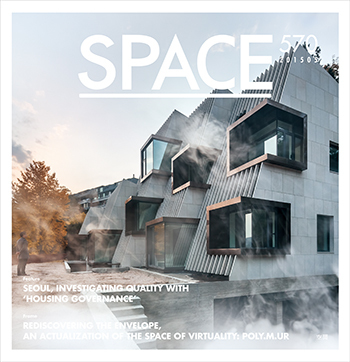 Poly.m.ur is featured in May issue of SPACE magazine. Under the title of ‘Rediscovering the Envelope, an Actualization of the Space of Virtuality: POLY.M.UR’, the article dealt with the directionality as well as methodology of practice in depth. 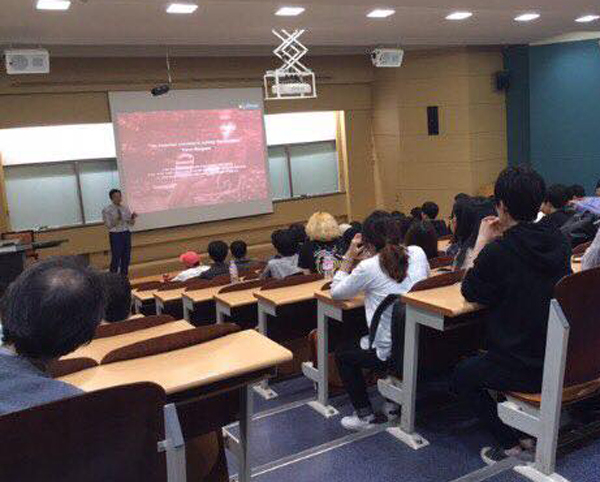 In addition, Yongsun Jang, professor of Hong-ik University, discussed in depth the theoretical background and philosophy of it. Most of all, it was a good opportunity for us to re-examine what we have gone through during the past 8 years from the initial stage of practice to the present. Continuing this momentum, we strive to embark on the next chapter for further growth. We would like to express our deep gratitude towards publisher Hwang Yongchul, Editor in cheif Park SungJun of SPACE magazine and Editor Yoon Solhee. We also greatly appreciate Shin Kyungsub for such great photographs. 건축전문지 공간에서 5월호 프레임 기획으로 건축사무소 폴리머를 다뤄주셨습니다. 총 20 페이지에 걸쳐 사무소가 지향하는 방향성과 방법론을 깊이 있게 조명해주셨고 특별히 홍익대학교 장용순 교수님께서 좀더 이론적인 측면까지 보충해주셔서 더할 나위 없이 좋았던 기회였습니다. 무엇보다 2007년 런던에서 시작해 현재까지 근 8 년 동안의 과정을 돌이켜보는 계기가 되기도 했습니다. 처음에는 주로 현상 설계로 시작해서 2010년쯤 경영상의 위기를 겪기도 했고 그 후 실제 건축으로 실현시키기 위해 고군분투하며 고생했던 과정들이 주마등처럼 스치기도 했습니다. 이 기회를 통해 앞으로 더 노력하는 도약대로 삼고자 합니다. 아무쪼록 이런 좋은 기획을 마련해주신 공간지 발행인이신 황용철 대표님께 감사 드리고 이 기획을 기꺼이 결정해주신 박성진 편집장님, 그리고 담당이셨던 윤솔희 기자님께도 감사의 말씀을 올립니다. 또한 항상 좋은 사진으로 폴리머의 건축을 빛내주시는 신경섭 작가님께도 깊은 우정 깃든 감사의 말씀 드립니다. 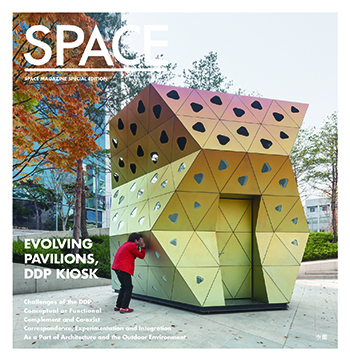 Space magazine published a special edition ‘Evolving Pavilions, DDP Kiosk’ in which potential of kiosks is re-examined in urban milieu via comparison with that of follies. 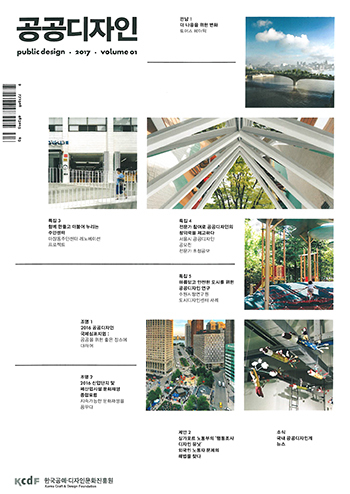 The article thoroughly featured all of ten kiosks in details and above all, K10 by poly.m.ur is featured as the main kiosk on the front and the last page. It made our efforts on this journey all the more worthwhile- we led design process for more than a year out of self-motivation and visited a town near Fukushima in Japan to persuade Mr. Horie to colour titanium panels. 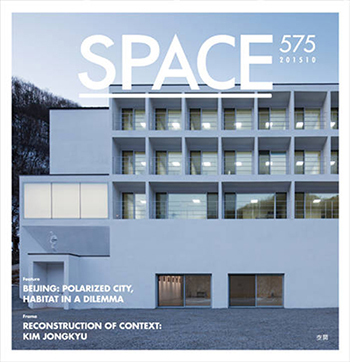 We would like to express our deep gratitude towards SPACE magazine and Editor Park Sung Jin. We also greatly appreciate Shim Younggyu for this meaningful article and Shin Kyungsub for photographs. 건축전문지 공간에서 ‘파빌리온의 진화, DDP 키오스크’ 란 제목으로 별책을 발간했습니다. 파빌리온, 폴리와의 비교를 통해서 키오스크의 역할을 재조명하고 동대문 디자인 플라자에서의 역할에 대해 설명했습니다. 열 개의 키오스크를 모두 자세히 다루었는데 폴리머가 디자인한 K10이 표지와 마지막 페이지에 메인으로 다뤄졌습니다. 일년이 넘는 설계 기간 동안 디자인을 자체적으로 변경하고, 티타늄 발색을 위해 일본의 후쿠시마 근처에 계신 호리에 씨를 만나고 왔던 노고가 잊혀질 만큼 보람찬 일이었습니다. 표지에 실릴 수 있도록 노력해주신 공간지와 박성진 편집장님께 감사의 말씀을 드립니다. 무엇보다 좋은 기사를 써주신 심영규 기자님과 어려운 시간을 내서 촬영해주셨던 신경섭 작가님 감사합니다. 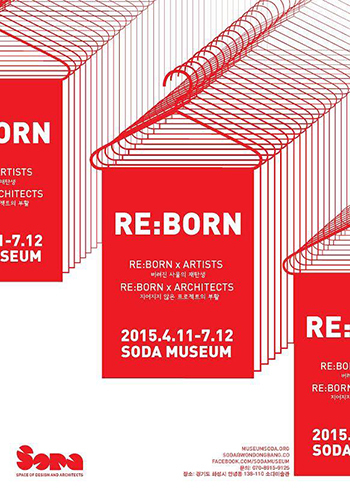 SODA museum will hold an opening exhibition named ‘RE:BORN’ inviting three groups of artists, designers and architects. Under the subtitle ‘Unbuilt Dreams’, the architecture part will show projects that have not been realized and remained unbuilt by 70 architects including poly.m.ur. Poly.m.ur has chosen the ‘Roundabout Tower’ that we proposed as an alternative in order to deal with housing shortage problem in London. The project is meaningful that we did purely for the research without any commission as the first project of poly.m.ur as well as it has been widely published in Mark magazine, C3 and so on. In addition it was exhibited in London Design Festival in 2007. 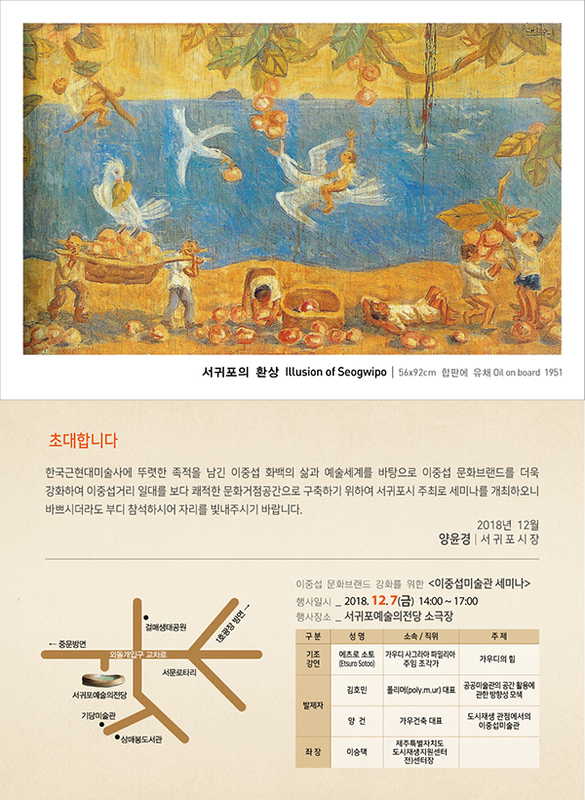 The exhibition will continue from the 11th of April till the 12th of July in SODA museum located in Hwaseong city. 버려진 찜질방을 전시 공간으로 탈바꿈한 소다 뮤지엄에서 예술가, 디자이너, 건축가가 세 부문으로 나뉘어 첫 개관 기획전으로 ‘리본(RE:BORN)’ 전을 개최합니다. 폴리머를 포함한 70 명의 건축가들과 함께 하는 건축 전시는 ‘Unbuilt Dreams’ 란 소제목으로 계획안으로만 남겨져 있는 프로젝트들을 전시합니다. 폴리머는 2007년 런던에서 사무실을 시작하며 런던의 공동 주택에 대한 대안으로 순수 연구 활동으로 시작했던 라운드어바웃 타워를 선정하였습니다. 마크지, C3 외 여러 매체에 소개되고 2007년 런던 디자인 페스티발에서 전시되었을 정도로 많은 조명을 받았던 프로젝트였습니다. 전시는 4월 11일부터 7월 12일까지 경기도 화성시에 위치한 소다미술관에서 개최됩니다. 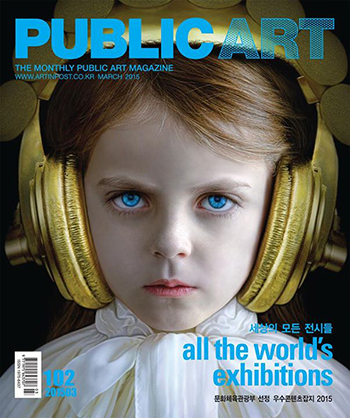 Public Art Magazine published an 8 page article titled ‘Public Art & Kiosk’ after a revisit to DDP Kiosks. 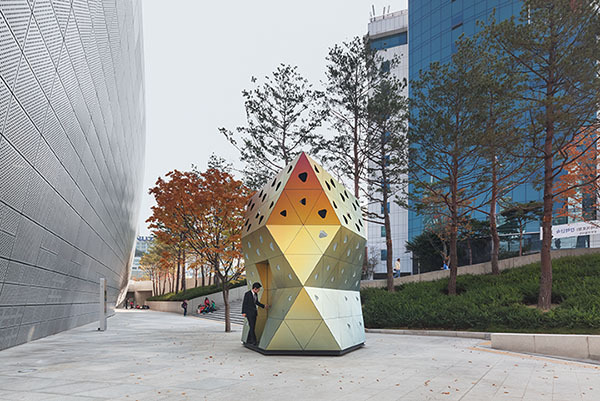 Eunju Han, director of Soft Architecture Lab and former editor of Space Magazine, discussed in depth the potential of kiosks in urban milieu from the perspective of public art. 아트전문지 퍼블릭 아트에서 공공미술과 키오스크란 제목으로 동대문 디자인 플라자 키오스크 프로젝트에 대해 총 8 페이지에 걸쳐 다루어주셨습니다. 한때 공간지 편집장이셨고 지금은 소프트아키텍처 랩 한은주 대표께서 현대 건축의 가변적인 속성과 키오스크의 특성을 연결하여 공공에 대한 역할과 그것의 가능성의 관점에서 글을 써주셨습니다. 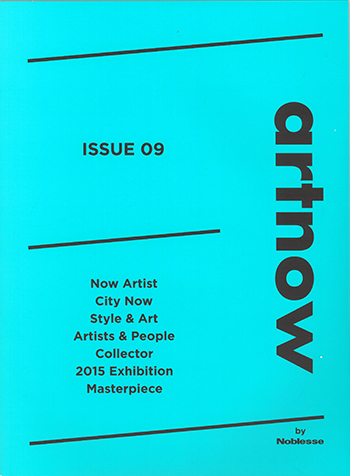 Interview of Homin Kim by Byungho Kim (Artist) is featured in March issue of ARTNOW issue 09 by Noblesse. Under the title of ‘A pair of Module’, the article comprises of a casual conversation between the two on broad range of topics from approach to work, exhibitions, general interests, to future plans etc. They explained their recent works in detail and their common interest module systems. Particularly, the kiosk project of ‘Camouflage’ was focused mainly, and the canopy project of reformatory in Busan held by Ministry of Culture, Sports and Tourism was also mentioned as a cooperative project by two artists. 노블레스에서 발간하는 아트나우에서 김호민 소장과 김병호 작가를 인터뷰했습니다. ‘이토록 찌릿찌릿한 모듈 한 쌍’ 이라는 다소 자극적인 제목으로 두 분의 대화를 그대로 녹취해 기사로 담았습니다. 모듈의 반복에 의한 시스템에 관심을 갖고 계신 김호민 소장과 관심사를 공유하는 김병호 작가는 평소 깊은 친분으로 무겁지 않은 대화를 이끌며 두 분의 작업에 대해 상세히 설명하셨습니다. 최근 완공한 동대문 디자인 플라자의 키오스크 프로젝트부터 문화체육관광부에서 주최하는 부산소년원 캐노피 프로젝트를 함께 하면서 느꼈던 소소한 얘기들도 있습니다. We are very glad to announce that the ‘Happy Canopy’ project has been completed. It was commissioned by Korea Craft and Design Foundation as a part of a year-long project named ‘Creating Happy Place with culture’ that has been held by Ministry of Culture, Sports and Tourism. 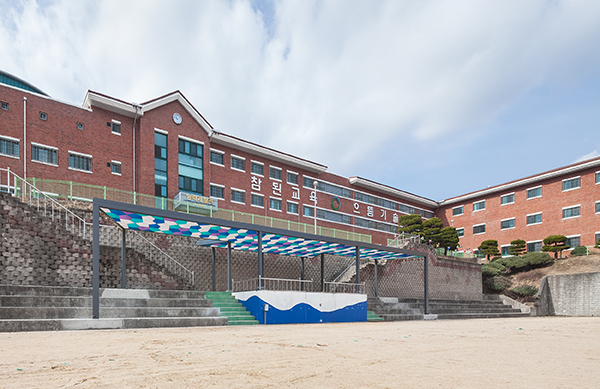 It was for the purpose of providing more opportunities for those who are not very much exposed to culture, and Busan Juvenile reformatory is one of six sites including three other military base camps and two more juvenile reformatories. Upon visits to the site over ten times during the year, we examined the needs of the client through student workshops, interviews and ‘pilot project’ held in collaboration with Byungho Kim (installation artist) and Juhyun Lee (director of Moving Moments). In spite of unexpected last-minute changes in design that made meeting the deadline extremely difficult, we were fortunate to hold the final ceremony in success on the 6th of March with everyone involved sharing memories over a short film documenting the entire process. We greatly appreciate all the supports from those who contributed to this project, including Miyeon Jeon (chief director of Korea Craft and Design Foundation), Gyehyun Whang (director of Busan juvenile reformatory), Jisu Kim (chief sector) and Byungho Kim and Juhyun Lee (collaborators). 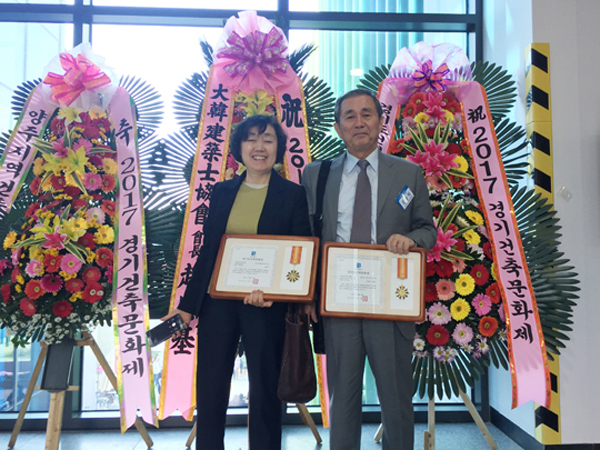 In addition, we acknowledge passionate involvement of the contractor, Heein Park (Daehee Corp.) and Donghoon Park (Special Tech). Above all, congratulations to Jaeman Lee (poly.m.ur) who was more than willing to catch the earliest train for the project. 문화체육관광부 주최, 한국공예디자인진흥원 주관으로 진행했던 부산소년원의 행복한 캐노피가 완공되었습니다. 소외된 계층에 문화의 혜택을 넓히겠다는 취지 하에 군부대 3 곳, 소년원 3 곳을 대상지로 ‘문화로 행복한 공간 만들기’ 프로젝트의 일환으로 시작되었고, 지난 1 년간 대상지 심사를 시작으로 총 10 회에 걸쳐 현장 방문, 학생 워크샵 및 담당 선생님 면담, 파일럿 프로젝트를 문화기획자 김병호 작가, 무빙모멘츠의 이주현 대표와 함께 진행했습니다. 그 동안 워크샵을 통해서 학생들의 요구 사항을 파악하고 선생님과의 면담을 통해 조율하며 주어진 예산 내에서 실행하기 위해 많은 노력들이 있었습니다. 우여곡절 끝에 디자인이 급하게 수정되면서 기간 내에 완공될 지 알 수 없는 순간에 처하기도 했습니다만 3월 6일에 강당에서 학생들과 선생님들이 모두 모여 그 동안 과정을 모은 다큐멘터리와 다과회를 즐기면서 아름답게 마무리되었습니다. 많은 도움을 주신 부산오륜정보학교 학생들, 열정적으로 학생들을 보살피고 계신 황계연 원장님, 김지수 과장님을 포함한 선생님들과 김병호 작가, 이주현 대표님께 감사의 말씀 올립니다. 무엇보다 처음부터 끝까지 세심하게 챙겨주시고 믿음을 주신 한국공예진흥원의 전미연 팀장님, 송유미 박만식, 최동원 주임님께 감사 드립니다. 또한 새벽 5시 부산 기차를 마다하지 않았던 폴리머의 이재만 팀장과 최종 모델을 만든 민홍 인턴도 수고 많았습니다. 무엇보다 어려운 시공을 맡아주신 대희 산업의 박희인 사장님과 스페셜 테크의 박동훈 소장님 고생 많으셨습니다. 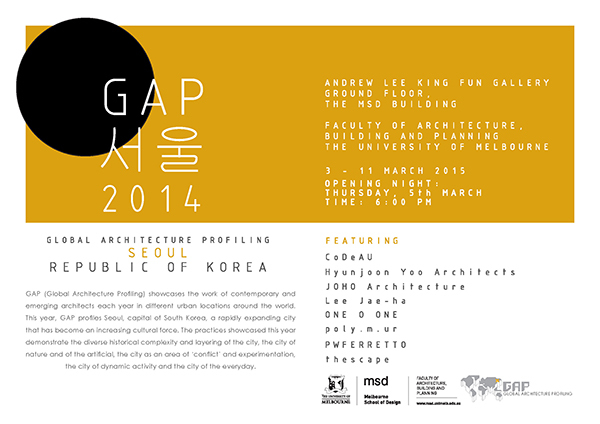 GAP Exhibition in Melbourne Univ. Poly.m.ur was invited to exhibit some of our works at the Faculty of Architecture, Building and Planning at the University of Melbourne. The exhibition is the fifth annual GAP (Global Architecture Profiling) exhibition with the aim of cultivating cross-cultural ties between cities. It is introduced by Blair Gardiner (lecturer of Melbourne School of Design) and run spontaneously by a student group. 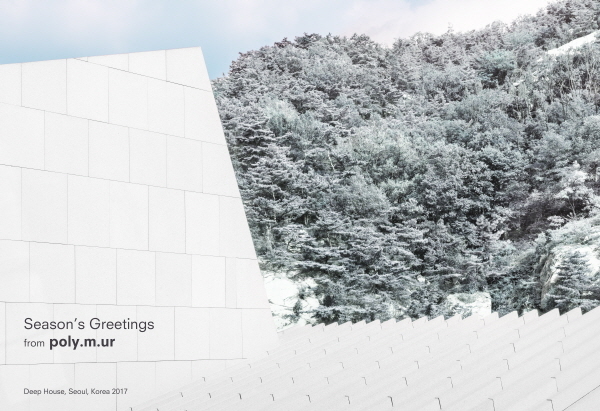 This year they are focusing on Seoul, Korea and features projects by eight young and progressive practices such as CoDeAU, Hyunjoon Yoo Architects, Joho Architecure, Lee Jae-ha, One O One, PWFERRETTO, thescape and Poly.m.ur. The exhibition is running from the 3rd of March unitl the 11th of March at the Andrew Lee King Fun Gallery. 폴리머의 작업이 멜버른 대학교 건축과에서 다섯 번째로 열리는 갭 전시회의 일환으로 초대되었습니다. 이 전시회는 매년 한 도시와 건축가들을 선정해 소개하고 그로써 두 도시 간 문화의 교류를 도모하자는 블레어 가드너 교수님의 아이디어에 학생들의 자발적인 참여로 운영되고 있습니다. 올해는 서울이 선정되었고 코데오, 유현준, 조호, 이재하, 원오원, 피터 페레토의 총 여덟 명의 진취적인 사무실들과 함께 전시하게 되었습니다. 장소와 기간은 멜버른 대학교 건물 1층 리킹펀 갤러리에서 3월 3일부터 11일까지입니다. Homin Kim, director of poly.m.ur, has been invited by DBUK to speak as part of the long-running DBUK design workshop series. Please join us on the 7th of March at 2pm at poly.m.ur’s office in Itaewon. 김호민 소장님께서 디북 디자인에서 디자인 지망생들을 대상으로 기획된 워크샵의 일환으로 3월 7일 이태원 사무실에서 강의를 진행합니다. 관심 있는 분들은 디북 블로그(http://blog.naver.com/dbuker)의 워크샵 소식란을 참고해주세요. DOCUMENTUM (issue 3) wrote an article about JW Research Centre covering 8 pages. In 2010 the project started with a disconcerting requirement that they wanted to apply the Korean traditional style of architecture to its exterior design in order to keep its identity as a research centre for national heritage. It took such a long time to design it in a contemporary way and also to persuade them to take it. Within very limited time schedule, we worked so hard day and night to make it on time. We greatly appreciate for Heekyung Moon, Sangki Lee staring it from the competition stage till the end, Sunmun Kim and Juyoung Choi as interns and Suki Kwon, Jongchul Lee, Sunki Whang, Seokyoon Kim and Jaeho Song. Above all, thank for their great effort of having dealt with it with nice photos and drawings as well as texts. 제이더블유 리서치 센터가 다큐멘텀 3호에 8페이지에 걸쳐 개제되었습니다. 2010년, 문화재 연구소란 정체성을 확립하기 위해 한식 기와 지붕으로 설계해달라는 발주처의 요구를 오랜 시간에 걸친 설득을 거쳐 현재 디자인을 관철시켰던 보람이 있었고, 막상 실시 설계를 할 시간이 부족해 직원들과 많은 고생을 했던 점이 기억에 남습니다. 현상 설계부터 실시까지 많이 도와주셨던 문희경 실장님, 이상기 사원, 김선문 사원과 최주영 인턴 그리고 뒤늦게 합류해 수많은 밤을 새어준 권숙희 실장, 이종철 팀장, 황선기, 김석윤 사원과 시공 끝까지 마무리를 담당해준 송재호 사원 수고했습니다. 그리고 처음이자 마지막으로 김홍식 교수님과 함께 진행했기에 더욱 의미 있었던 프로젝트를 텍스트와 멋진 사진, 도면으로 소개해주신 다큐멘텀 발행인과 편집장님께 감사드립니다. Poly.m.ur is looking for exceptional, enthusiastic students to join its team of architects as an intern. There are opportunities within diverse projects for architectural assistants (from 3rd to 5th year). For international students, it is obligatory to receive scholarship to work abroad. Required are minimum 6 month period, good attitude to learn patiently, skillwise Expertise in Rhino, Sketch-up and Autocad. Renderting skills (ie. vray) and Revit would be a plus.  Please send CV, examples of work and cover letter digitally to info@polymur.com. 폴리머에서 유능하고 열정적인 학생들을 인턴으로 채용합니다. 3학년부터 5학년까지 (졸업예정자 제외) 건축 지망생들에게 다양한 프로젝트를 경험할 기회를 제공합니다. 단 국외에 체류하는 학생은 해외에서 일할 수 있는 장학금을 수여하신 분들로 한정합니다. 최소한 6개월 이상 일할 수 있는 분들로 무엇보다 참을성 있게 배우려는 자세를 갖추고 라이노와 스케치업, 오토 캐드를 다루는 능력이 필요합니다. 렌더링 (브이레이 등)이나 레빗을 다룰 수 있다면 좀더 긴밀하게 디자인 과정에 참여할 수 있습니다. 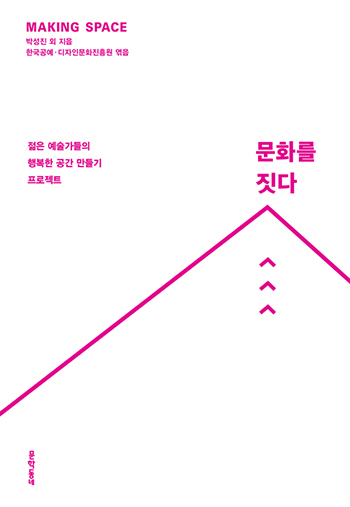 관심 있으신 분들은 커버 레터와 이력서, 포트폴리오를 info@polymur.com로 보내주세요. Space Magazine (issue 566) wrote an article about DDP Kiosks covering 8 pages titled ‘Evolving Pavilions, DDP Kiosk’. They described Kiosks each by each in relation to DDP (by Zaha Hadid) and tried to disclose their possibilities for the public. 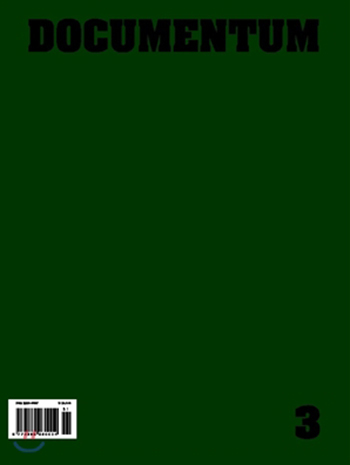 And above all, it is a great pleasure that Space Magazine dealt with K10 ‘Camouflage’ by poly.m.ur as their main pages with contents list and titles. 건축전문지 공간지에서 동대문 디자인 플라자 키오스크를 ‘파빌리언의 진화, DDP 키오스크’ 라는 제목으로 8 페이지에 걸쳐 다루었습니다. 각각의 키오스크를 DDP와 관련하여 공공에 대한 역할을 설명하고 가능성을 엿보았습니다. 무엇보다 폴리머에서 디자인한 키오스크 10 ‘위장’ 이 기사의 주요 페이지와 목차에서 주요하게 다루어졌습니다. 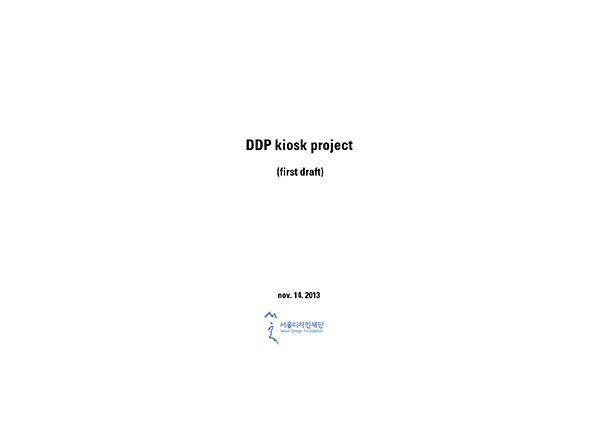 We are delighted to announce that DDP kiosk 10 is finally open to public. It is located in the DDP (Dongdaemun Design Plaza) by Zaha Hadid that was completed early this year and will play the role of providing information for the public to visit DDP. 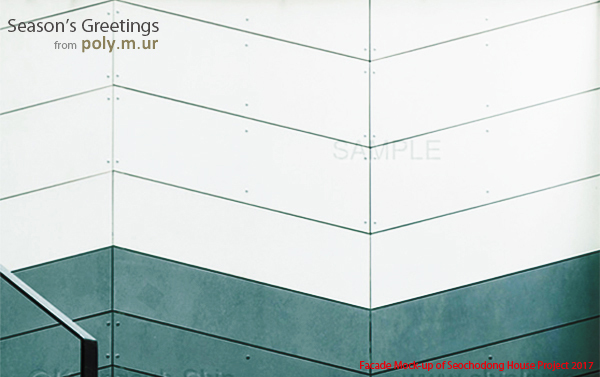 It is a simple geometric system that features the kiosk in addition to the gradient coloured envelope made of titanium cladded triangular panels. We would like to thank the DDP foundation for waiting for such a long time, Posco corp. for contributing us titanium cladded aluminium panels, Mr. Horie for colouring more than 200 titanium panels with different colours, N3 for construction and more than all, Youngjun Kim for giving us such a great chance to realize our idea in such an important public space. DDP 키오스크가 드디어 완공되었습니다. 자하 하디드가 설계하고 올 초에 개관한 동대문 디자인 플라자 내에 위치하여 방문객들에게 필요한 정보를 제공하는 역할을 맡게 됩니다. 가장 큰 특징은 구조와 형태가 정삼각형을 기본 단위로 하는 단순한 원리에 의해 만들어졌다는 것입니다. 마감재로 알루미늄에 티타늄을 도금하고 그것을 다시 발색한 판넬을 사용해서 독특한 외관이 완성되었습니다. 무엇보다 오랜 시간을 묵묵히 기다려주신 서울 디자인 재단과 티타늄 클래드 판넬을 협찬해주신 포스코, 200장이 넘는 판넬들을 일일이 발색해주신 호리에씨에게 감사드리고 싶습니다. 시공을 맡아주신 엔쓰리와 좋은 기회를 주신 김영준 소장님께도 깊은 감사의 말씀을 드립니다. Eleven Hills was opened yesterday an Italian restaurant under the name of Il Bianco. We are very excited to see this building completed after such a long time having taken almost three years to design and build. Most of all, it was even more meaningful since it was the first project to have worked with a very old friend as client. We greatly appreciate for Eleven ltd. with regard to having commissioned it to us and even built it. 용인 성복동 근생이 일비앙코란 이탈리안 레스토랑으로 문을 열었습니다. 설계와 시공을 마치는데 거의 삼 년이란 시간이 걸렸을 정도로 공을 들인 프로젝트였고 무엇보다 오랜 친구와 같이 한 첫 번째 프로젝트였기에 더 의미 있었습니다. 이 일을 기꺼이 맡겨주시고 시공까지 맡아주신 일레븐 건설에 깊은 감사의 말씀을 올립니다. We are delighted to announce that factory Heemang has been completed after such a short period of construction of 5 months. Design started in November 2013 and construction started in May right after planning permission was granted. Above all, the contractor ‘ EAN R&C’ deserves to be appreciated so much that they can make it on time. 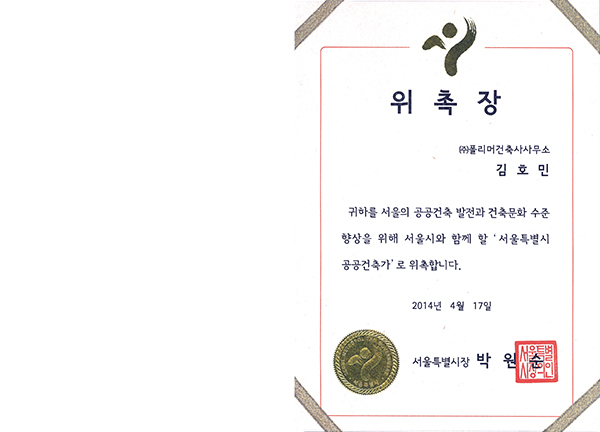 In addition we greatly thank for the full support of client and Cooperative of Paju Bookcity. 파주출판도시에 희망 공장이 완공되었습니다. 2013년 11월에 설계를 시작해 올 5월에 허가를 받고 곧바로 착공할 정도로 5개월이란 급한 일정과 제한된 예산에서 지어졌기에 더욱 뜻 깊습니다. 무엇보다 시공을 맡아준 이안 건설과 건축주이신 서석호 대표님 부부, 그리고 여러모로 도움을 많이 주신 파주출판조합에 깊은 감사의 뜻을 전합니다. We are delighted to announce that affordable housing project commissioned by SH housing corporation has been finally completed after such a long period of hard work. 사당동 도시형 생활주택이 작년 초 현상 설계에 당선된 후 오랜 설계 기간과 기다림을 거쳐 완공되었습니다. 석 달 동안 서울시 건축 자문과 허가, 실시 설계를 납품하고 작년 9월 착공 예정이었으나 일정이 늦춰지면서 올 초에야 착공할 수 있었습니다. 건축법이 강화되면서 이제는 사라진 도시형생활주택의 마지막 사례로 의미가 있었습니다. 지난 6개월동안 고생하신 시공사 진흥과 SH 담당자 분들께 깊은 감사의 말씀올립니다. 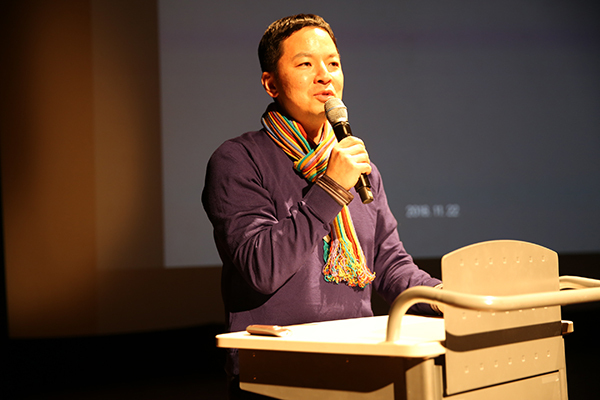 Homin Kim, director of poly.m.ur, has been appointed as a consultant of culture design project 2014 by ministry of culture, sports and tourism of Korea. By the end of this year, he is supposed to consult project to renovate the rundown bus terminal of Jeongseon-gun into a multifunctional cultural space for the local community. 폴리머 김호민 소장님이 문화체육관광부로부터 문화디자인프로젝트 사업의 컨설턴트로 위촉되었습니다. 연말까지 정선군의 낙후된 고속버스터미널을 지역 주민들을 위한 문화공간으로 탈바꿈하는 프로젝트를 컨설팅하는 역할을 담당하게 됩니다. 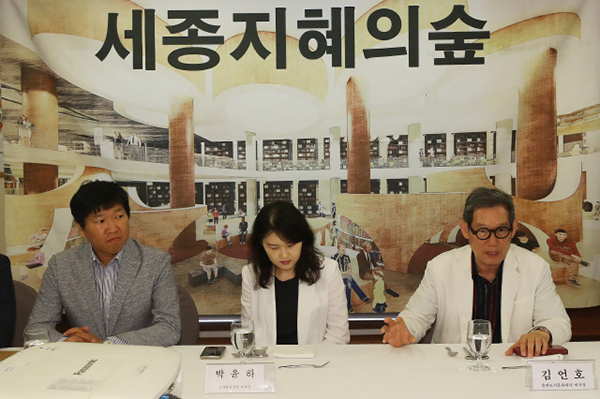 Homin Kim, director of poly.m.ur, has been reappointed as a public architect of Seoul by the city council. During next two years, he is supposed to take roles for enhancing the standard of public architecture in the city. 폴리머 김호민 소장님이 서울시 공공건축가로 재임명되었습니다.향후 2년간 서울시 공공건축물의 설계, 기획 및 조정, 자문 역할을 담당하게 됩니다. 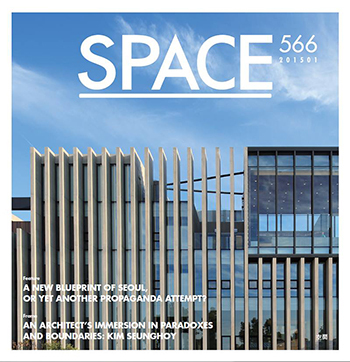 Space Magazine (Issue 556) dealt with JW marriott Hotel in the critique section where projects are generally discussed between both an architect and a professor. This time Park Joonho (architect, EAST4) and Choi Wonjoon (professor, Soongsil Univ.) were invited to look around the building, discuss and write articles about it. After a half-day long tour with Park Sungjin (chief editor of Space magazine), we had a very interesting discussion about it. 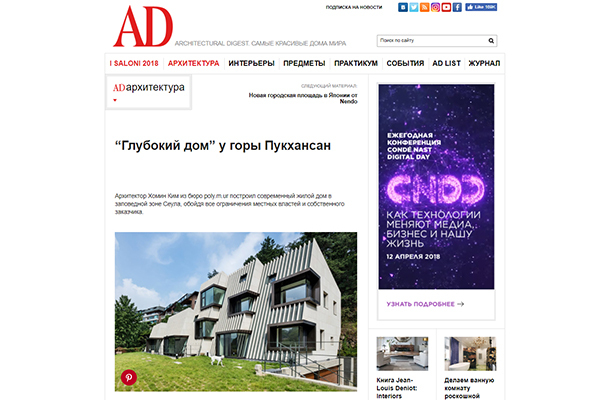 Covering 8 pages, the articles wrote about the project regarding aesthetics, social aspect and role of architect that were worthwhile to think in depth. We greatly appreciate for Space magazine to share this kind of opportunity for us. 제이더블유 메리어트 호텔 프로젝트가 건축전문지 공간지 크리틱 섹션에 개제되었습니다. 건축가 한 분과 교수님 한 분을 모시고 프로젝트를 비평하는 섹션으로 이번에는 이스트 4의 박준호 소장님과 숭실대 최원준 교수님께서 함께 해주셨습니다. 한 시간 반 정도 호텔을 돌아본 후에 두 분과 공간의 박성진 실장님과 함께 작업에 대한 매우 흥미로운 대화를 나누었습니다. 8페이지에 걸쳐 프로젝트의 미학, 사회적인 면 등 다양한 관점을 다루어졌고 더불어 건축가의 역할에 대해서도 깊이 있게 생각할 수 있는 기회가 되었습니다. 이처럼 좋은 기회를 주신 공간지에 깊은 감사의 말씀을 드립니다. 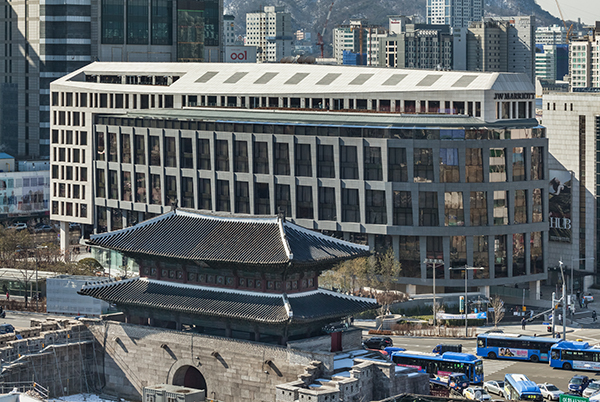 We are very delighted to announce that JW marriott Dongdaemun Seoul Square is finally open. In 2011 poly.m.ur got a commission to design the full package of exterior part and after that, merely for three month succeeded in all planning procedures including national cultural heritage review. In addition to Dongseung Ltd, the client, we greatly appreciate for our consultants, Kunwon architects and planners who were mainly in charge of Core and Shell, Wilson Associates (interior design), DAHN Enginees and Consultants, Dongyang Structural Engineers group (structure), LHYn (landscape), Hanil MEC (M&E), Hanmi Global (CM) and above all GS Engineers and Contruction (Contractor) who worked really hard to try to realize our first concept of exterior design. 제이더블유 메리어트 호텔이 드디어 문을 열었습니다. 2011년, 호텔의 외관 디자인 전체를 맡아 단 삼 개월 내에 종로구청 심의와 문화재 심의를 포함한 허가 과정 일체를 끝냈던 일화가 있기도 합니다. 지난 삼 년 동안 내부 구조와 허가 과정을 맡아주신 건원 건축과 인테리어 디자인의 윌슨 어소시에이트, 단구조, 동양구조와 기계 전기설비 설계의 한일 엠이씨, 한미 글로벌과 무엇보다 외관 디자인을 실현하기 위해 끝까지 노력해주신 시공사 지에스 건설에도 감사의 말씀을 전합니다. 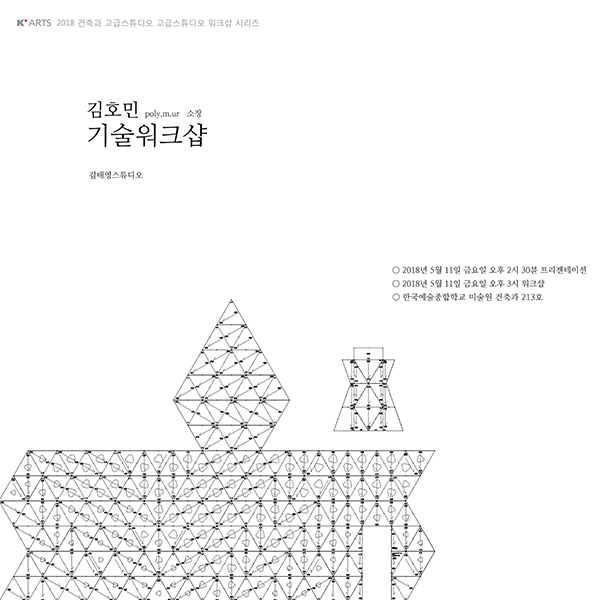 poly.m.ur has been invited to design three kiosks in Dongdaemun Design Plaza with other architects, D.Lim (Sun Kim), IaN+ (Luca Galofaro), UFO (Jonas Lundberg), OZ (Seungsoo Shin), NL ( Kamiel Klaasse), Hyunjoon Yoo, MY architecture( Meejin Yoon+Eric Howeler), Atelier lion Seoul (Sojin Lee), and OAM (Christina Garcia Baeza+Inaki Perez). The kiosks are supposed to be self-contained and also self-sufficient as well as light-weighted and ease for relocation. Above all, they should create a strong relationship with DDP. 자하 하디드가 디자인한 동대문 디자인 플라자에 들어설 키오스크를 폴리머가 디자인하게 되었습니다. 디림 건축, 이안 플러스, 유에프오, 스튜디오 오즈, 엔엘 아키텍츠, 유현준, 마이 아키텍처, 아틀리에 리옹과 오에이엠과 함께 각각 세 개씩 키오스크를 디자인합니다. 이들은 경량 구조로 이동이 가능한 구조로 외부 방문객을 위해 내부에서 일어나는 전시와 이벤트를 홍보하고 안내하는 역할을 맡게 됩니다. 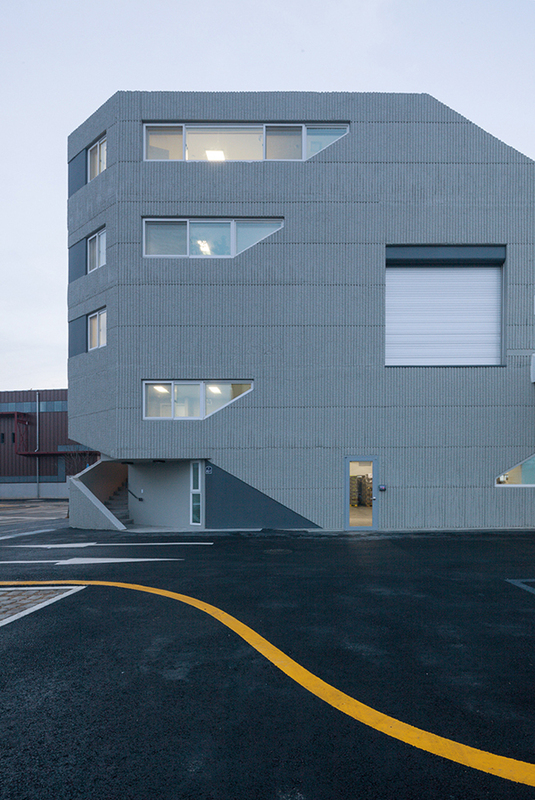 Poly.m.ur is commissioned to design a factory including offices and dormitory in Paju book city. 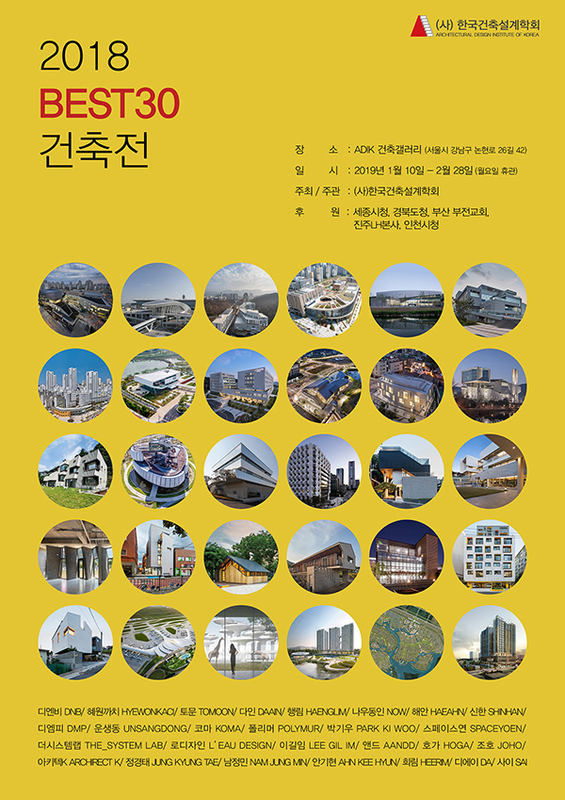 poly.m.ur has participated in a group exhibition of Paju Book City’s architects exhibited at ‘Inforoom 2′ in Paju. Honeybee Lounge is featured in Archidaily. poly.m.ur Seoul has moved to Itaewon in Yongsangu. Living Knot is published in Country Housing & Culture magazine. Megabox Multiplex cinema in Baekseok is completed. 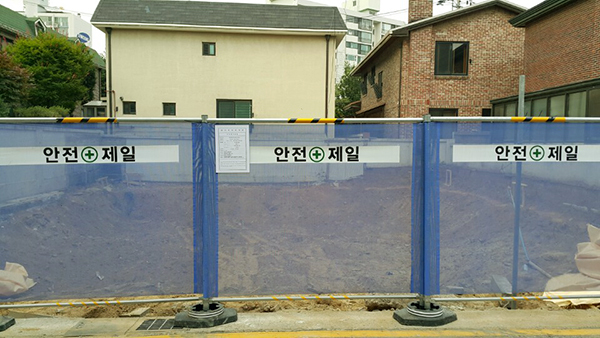 The construction of Sungbokdong 42417 in Yongin has started. 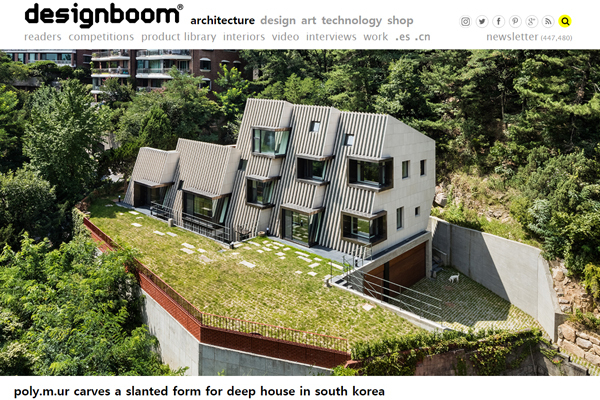 Interview of Homin about ‘Living Knot’ house in Gangneung is featured in Chosunilbo. Bresh Avenue Cafe in Gangdong is completed. 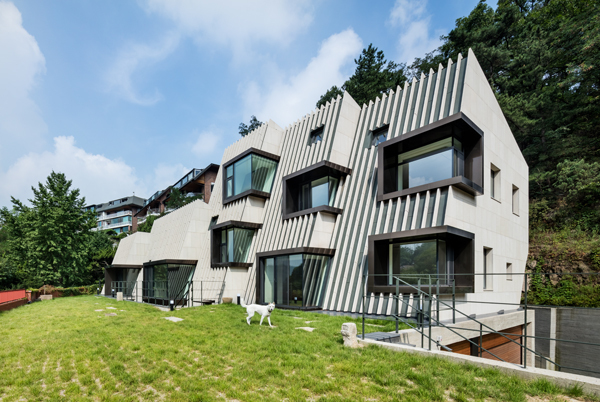 ‘Living Knot’ house in Gangneung is now completed. 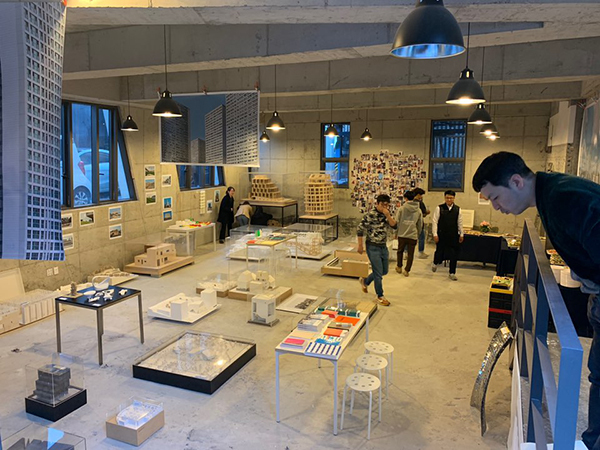 poly.m.ur has participated in a group exhibition ‘Global Young Korean Architects’ exhibited at ‘Dongdaemun Design Plaza’ in Seoul. Chris S. Yoo will teach Diploma Unit 8 at the AA from Sept.
Chris Yoo will teach at an intermediate unit at the AA from Oct.